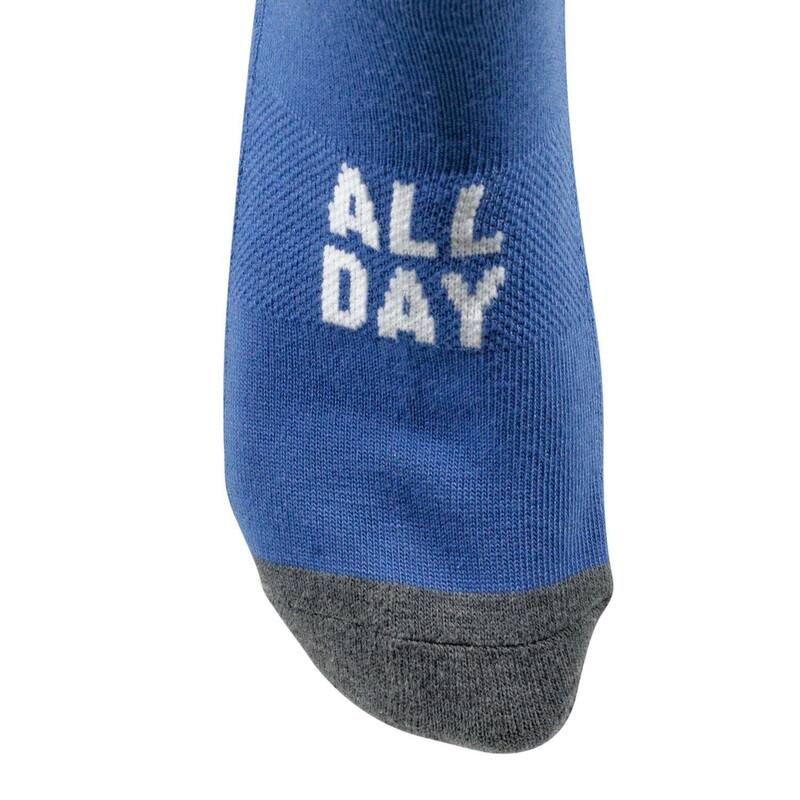 Blue Socks: All Day. 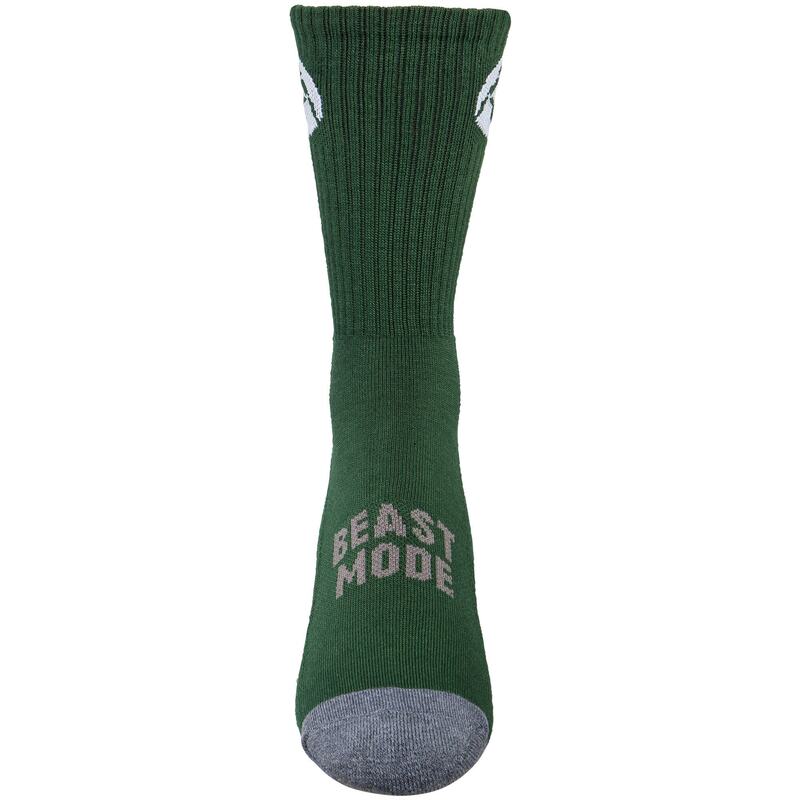 Dark Green Socks: Beast Mode. 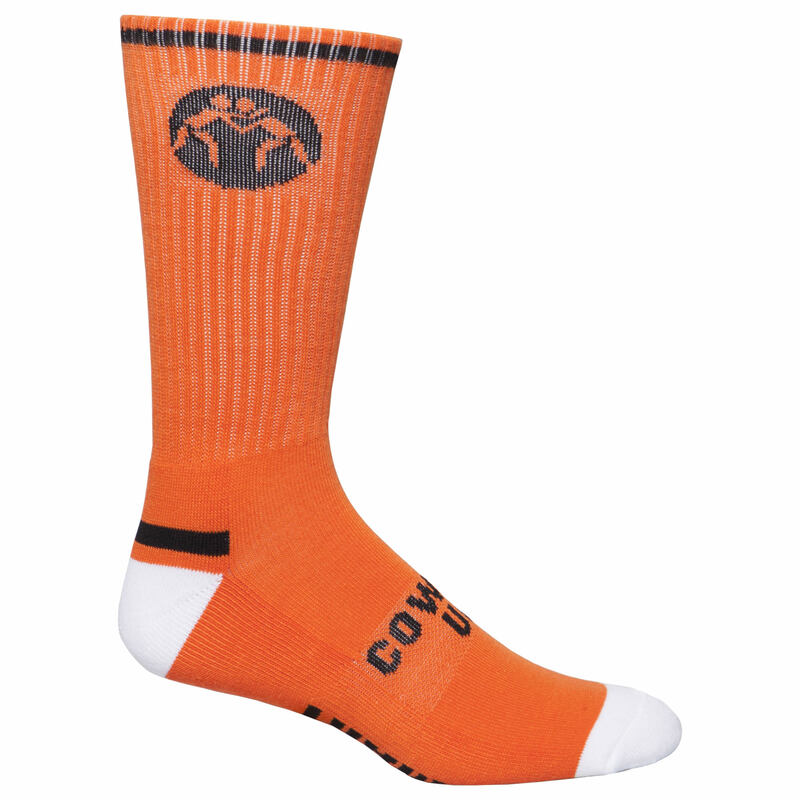 Orange Socks: Cowboy Up. 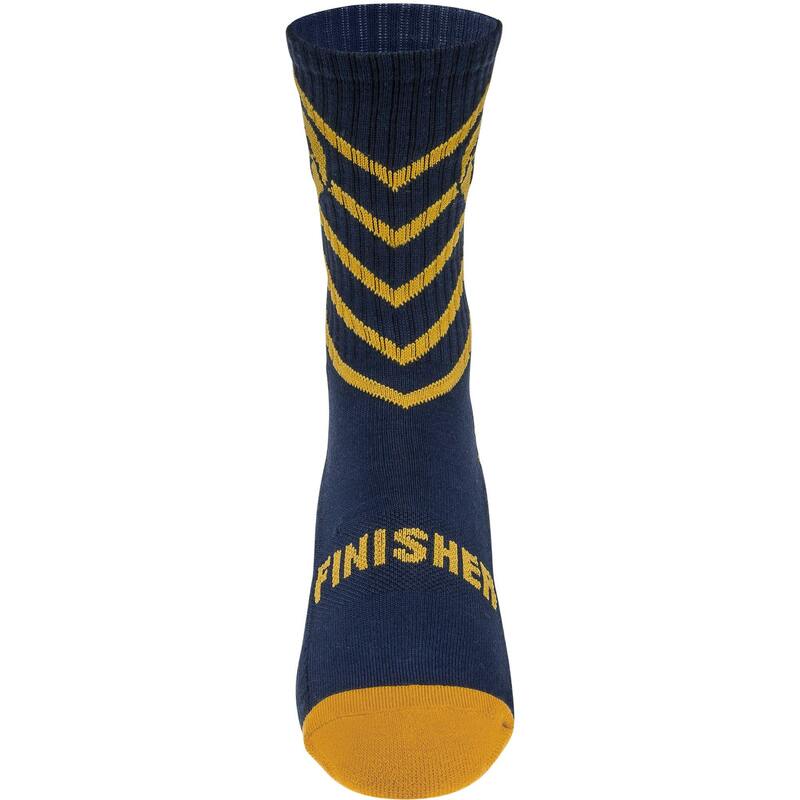 Navy Socks: Who's Next?. 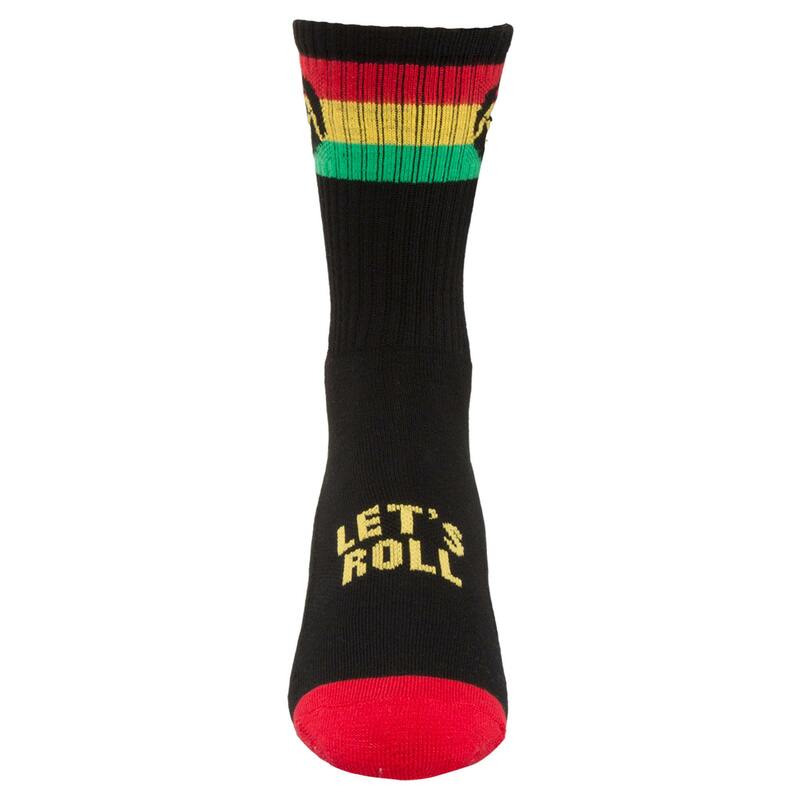 Rasta Sock: Let's Roll. Red White Sock: First Blood. 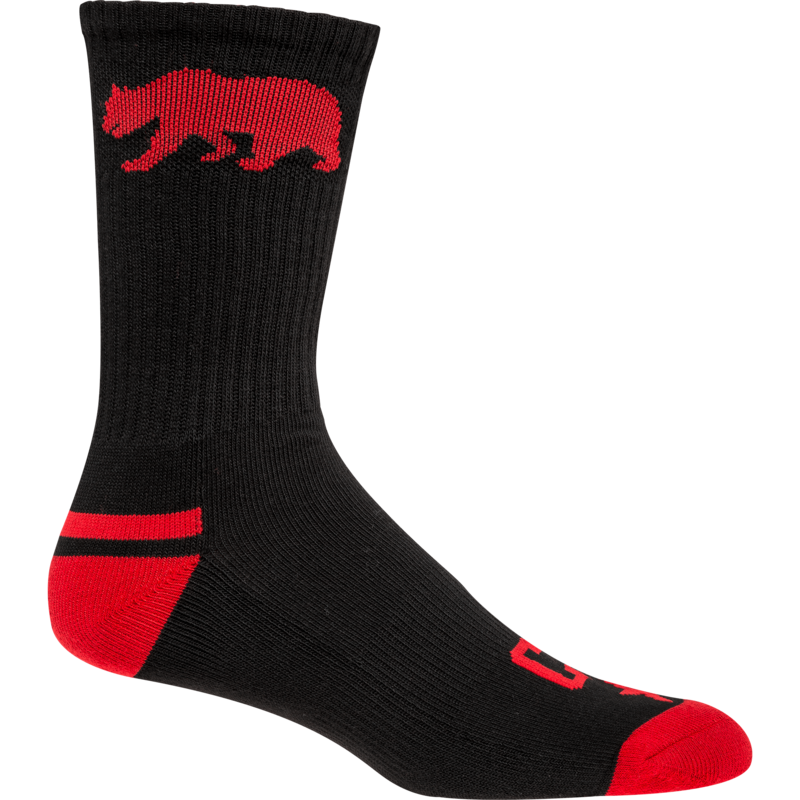 Black Red Sock: Red Bear. Navy White Red: Stars N Stripes. 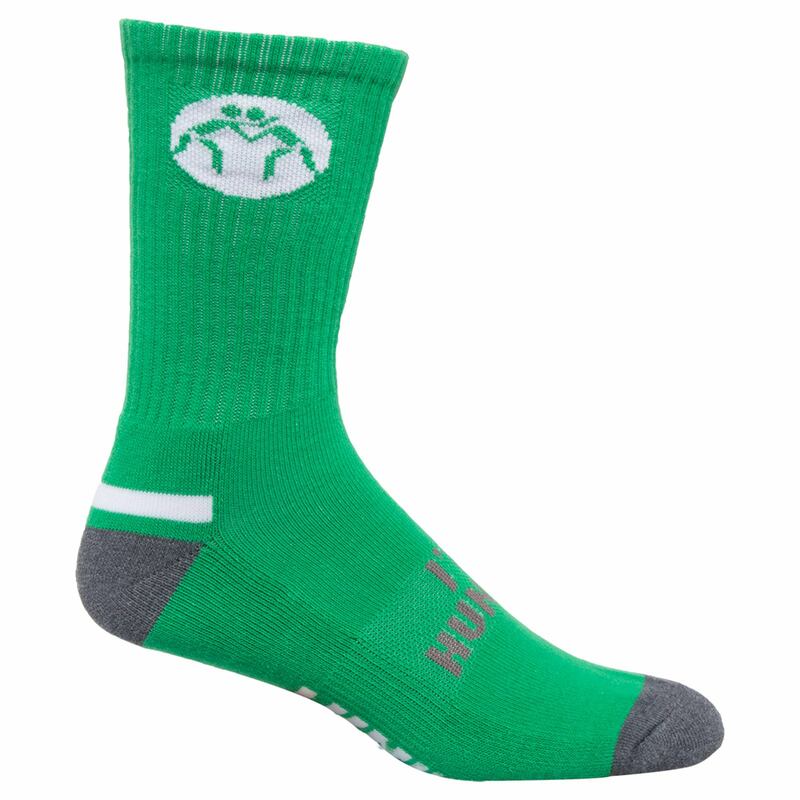 Green Gold Sock: Vamos. 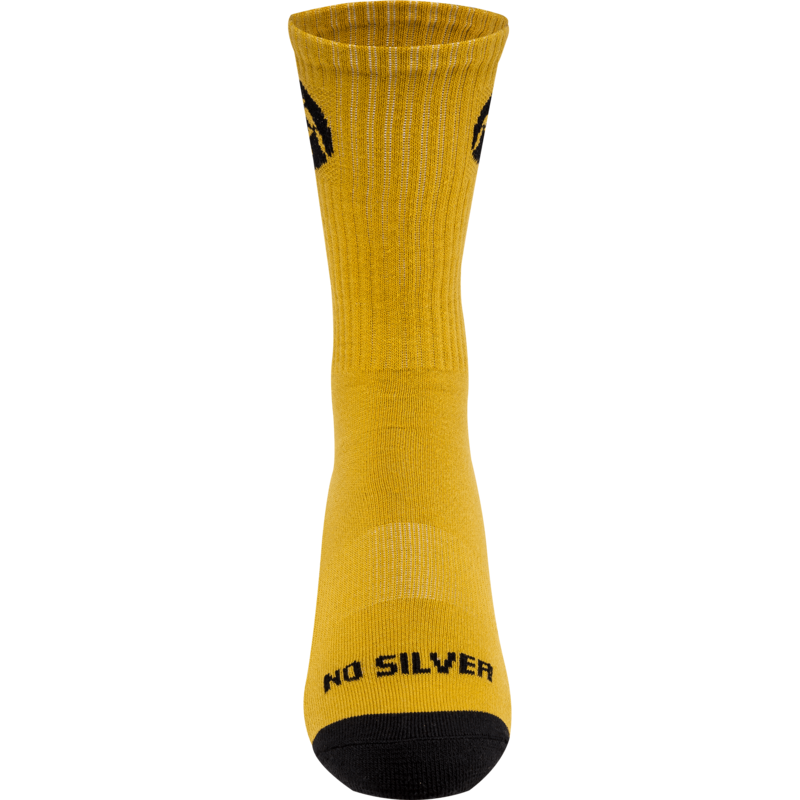 Gold Black Sock: No Silver. Grey Black Sock: Leg Rider. 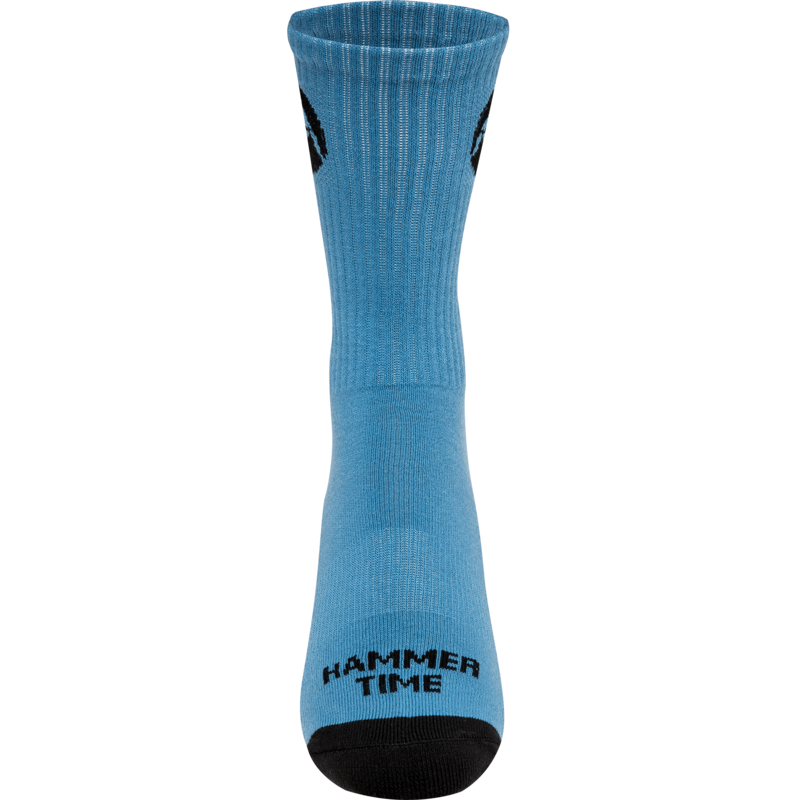 Light Blue Black: Hammer Time. 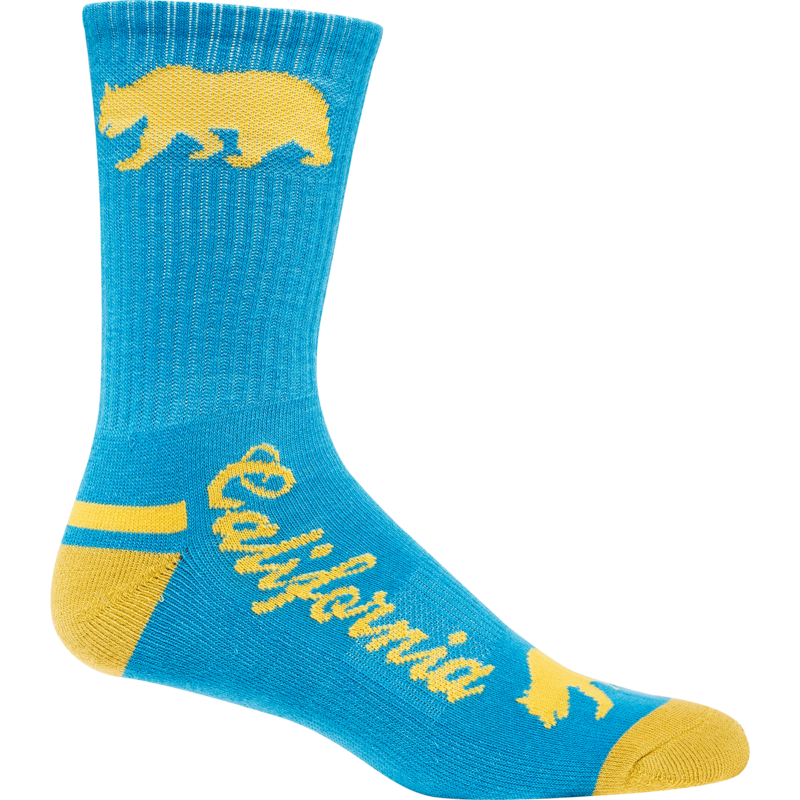 Blue Gold: California. Pink Sock: Bring It. 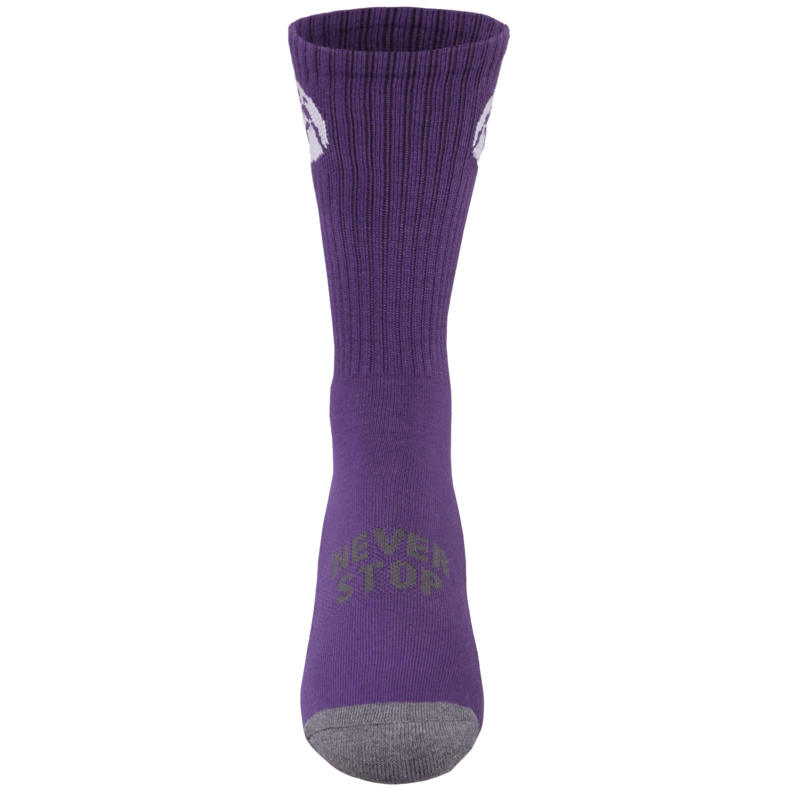 Purple Sock: Never Stop. 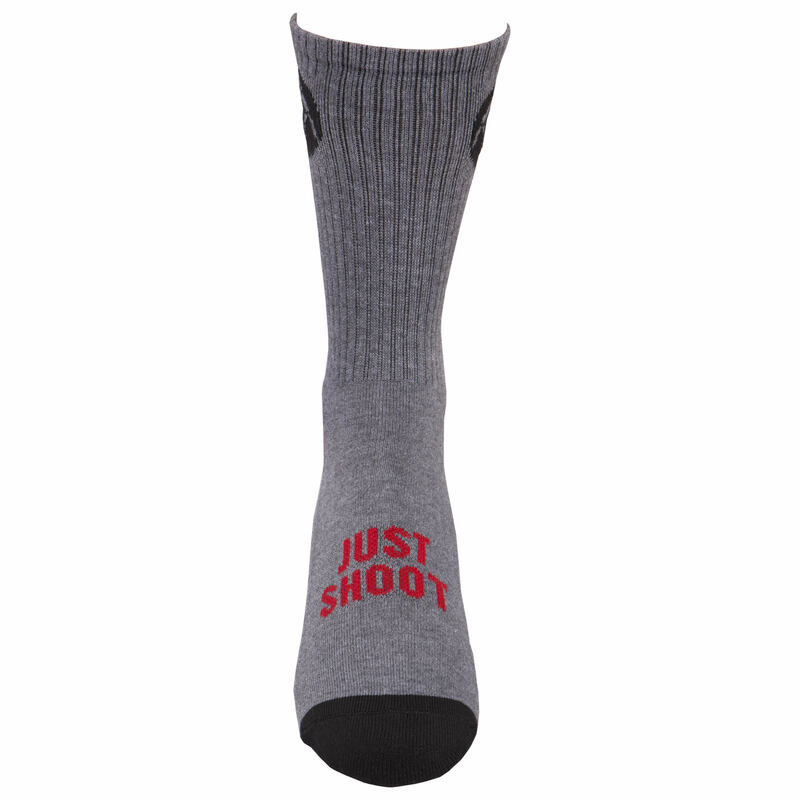 Dark Grey Black Red Sock: Just Shoot. Green White: I'm Hungry. Yellow Black: Get Gold. Black Orange: Growl. 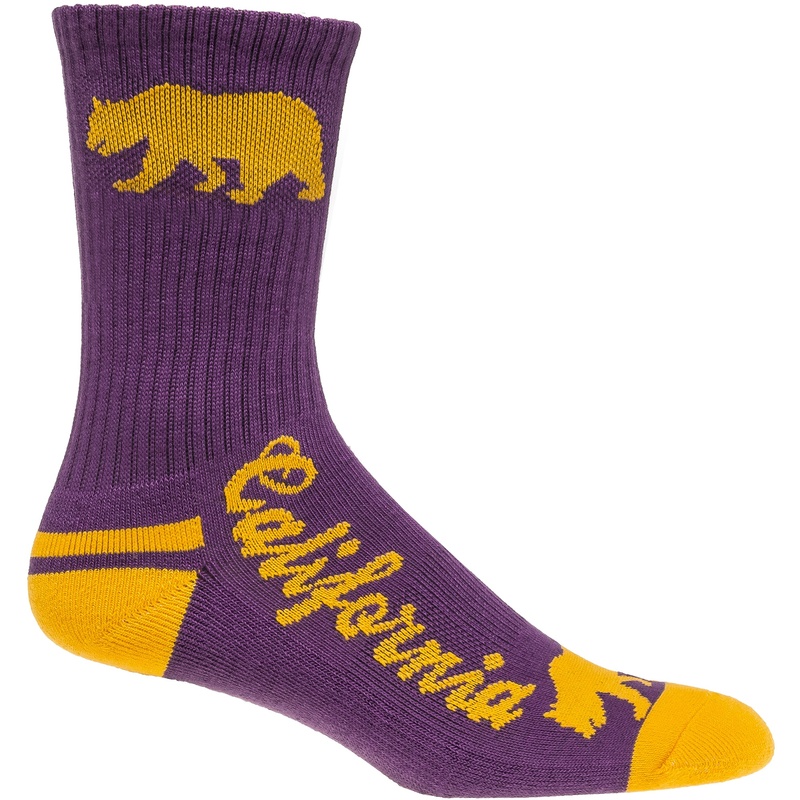 Purple Yellow: CA Bear Purple Yellow. Wash them the way you would the rest of your clothes! but no bleach. 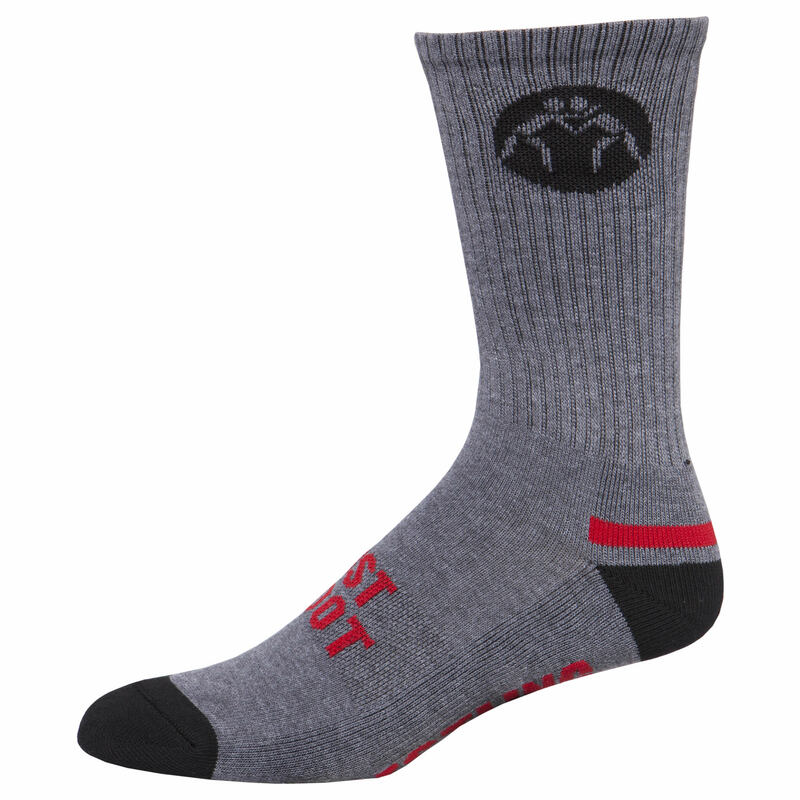 Our very own Performance Crew Wrestling Socks are the world-renowned comfiest socks ever. Whether you’re firing off double-legs, dropping in on a low-single, or launching people in headlocks, we’ve got your nasty feet covered. Literally. 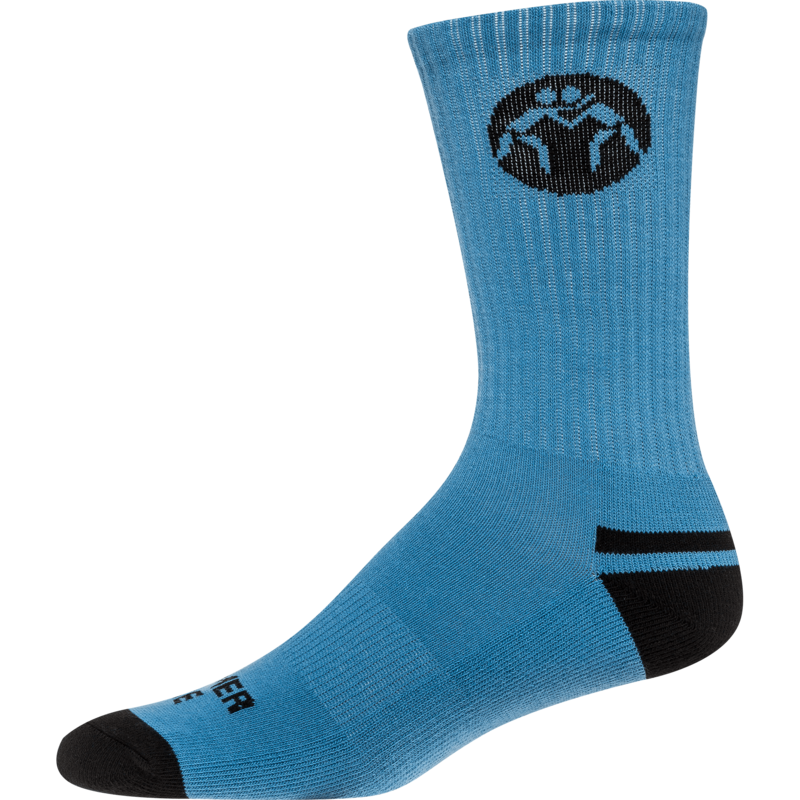 They’re made from a polyester-spandex blend that will stretch and form perfectly to your foot with no uncomfortable folding or bunching up, even when you break a sweat. 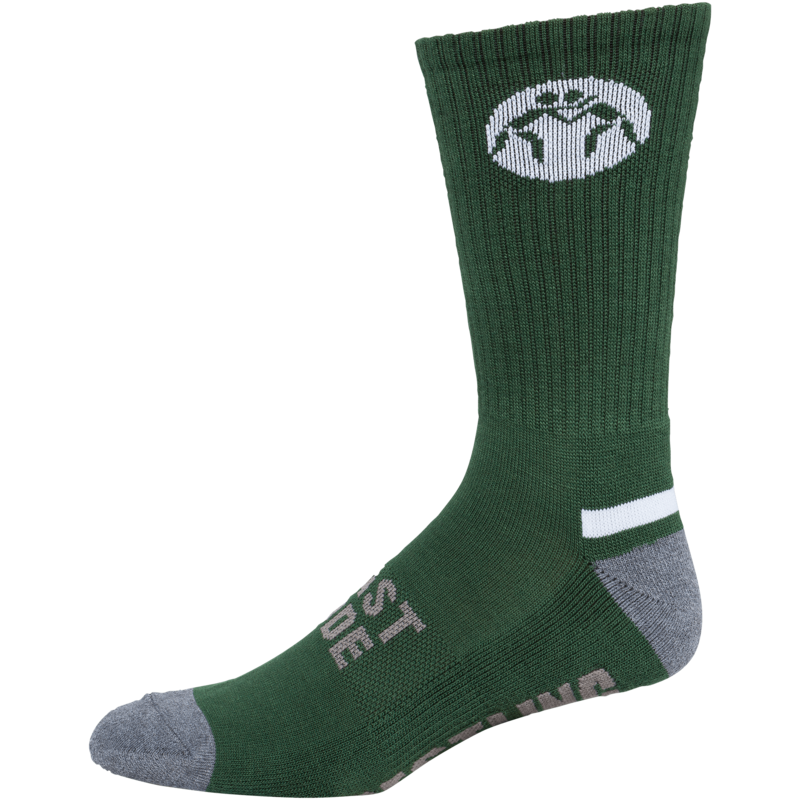 Our wrestling socks are a little thicker and more durable than regular socks to provide some added cushion and give you a snugger fit in your wrestling shoes. 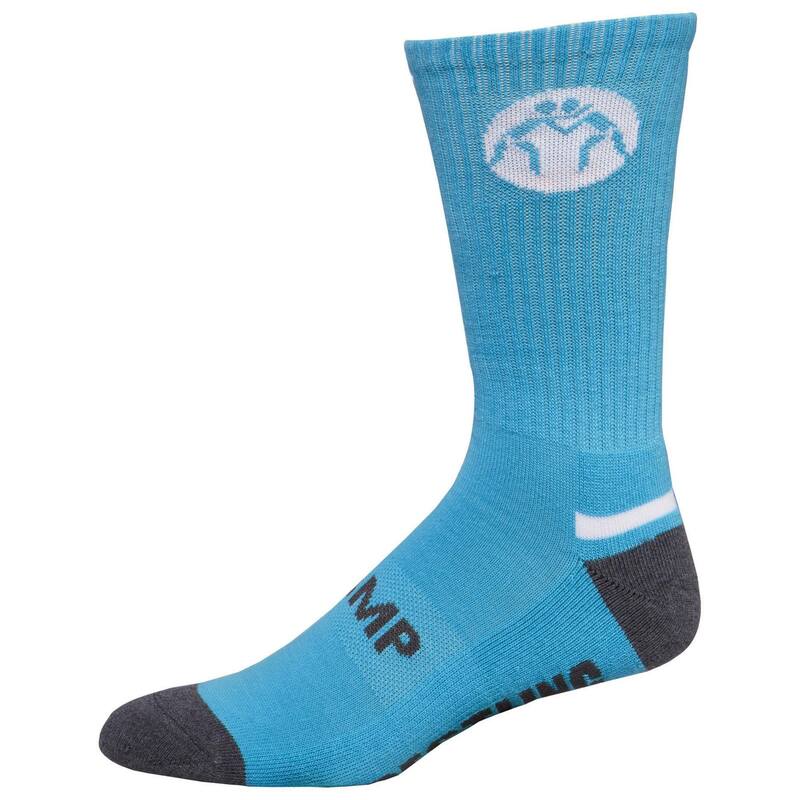 We know how much abuse wrestlers put their gear through, so these socks are made to last through hundreds of practices, matches, and wash cycles without getting misshaped and worn out. 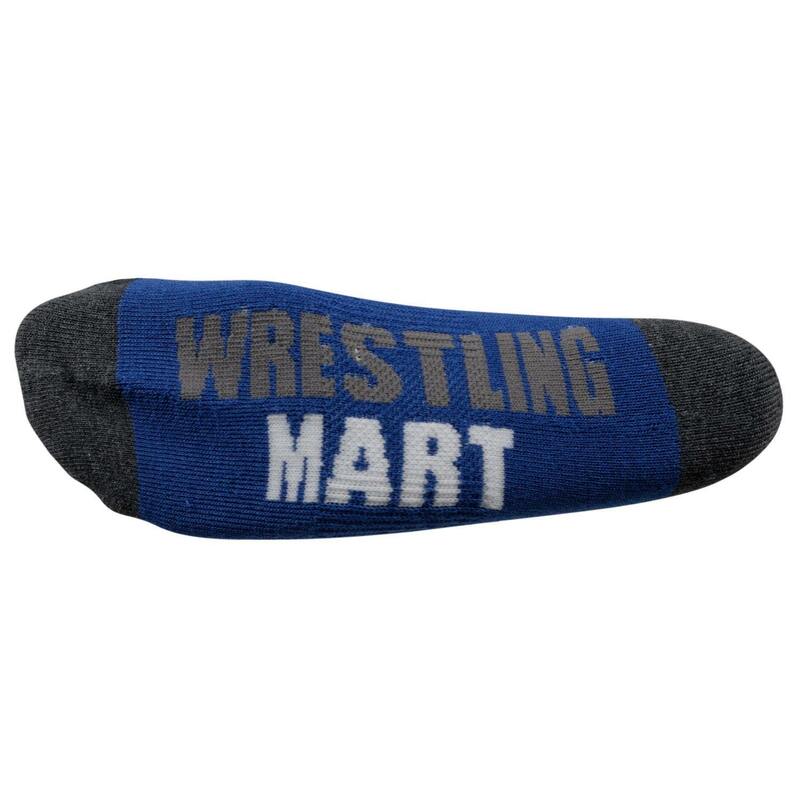 At WrestlingMart, we know our customers take their sock game very seriously, and so do we. 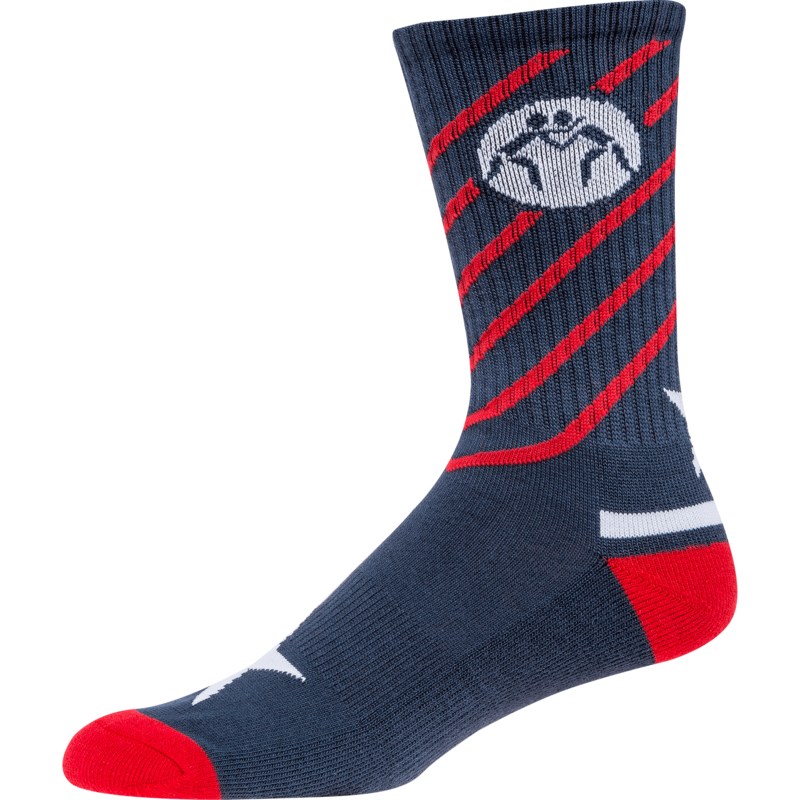 We know how particular wrestlers can be about their socks because they are such a crucial part of the gear you use every day for training and competition. 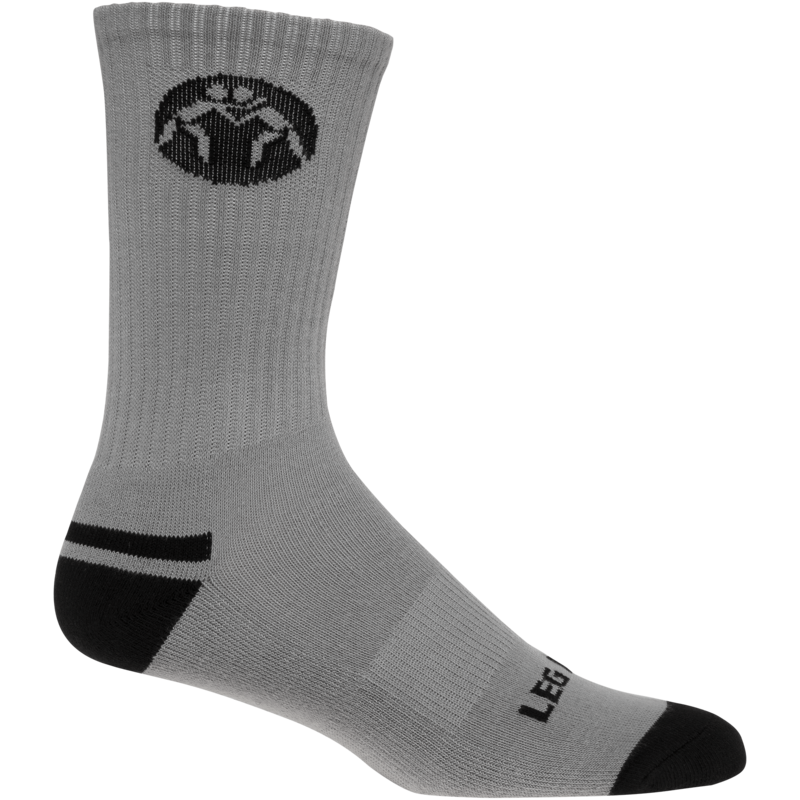 That is why we designed our socks to have all the qualities any great wrestlers look for in a pair of socks: quality, comfort, durability, performance, style, and affordability. Our socks are the perfect fit for male and female wrestlers at any level from youth and high school wrestlers to Olympic Gold medalists. In this sport, footwork and movement is paramount. You need something that can keep up with you through all your foot-fire drills, sprints, penetration steps, double legs, and scrambles. 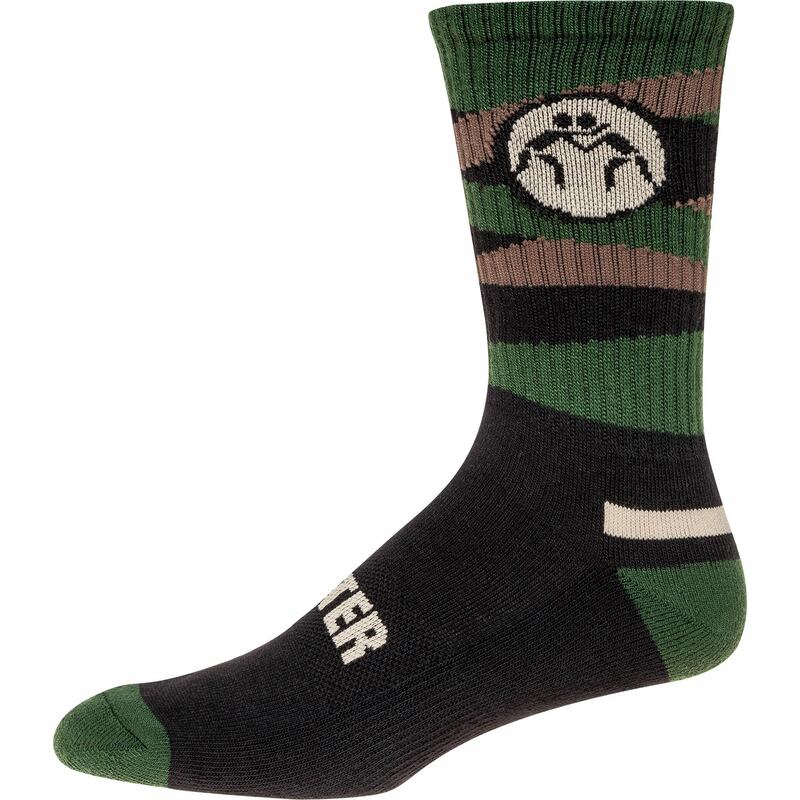 Wresters use their feet so much, so we want to make sure that they stay comfortable and ready for battle at all times. 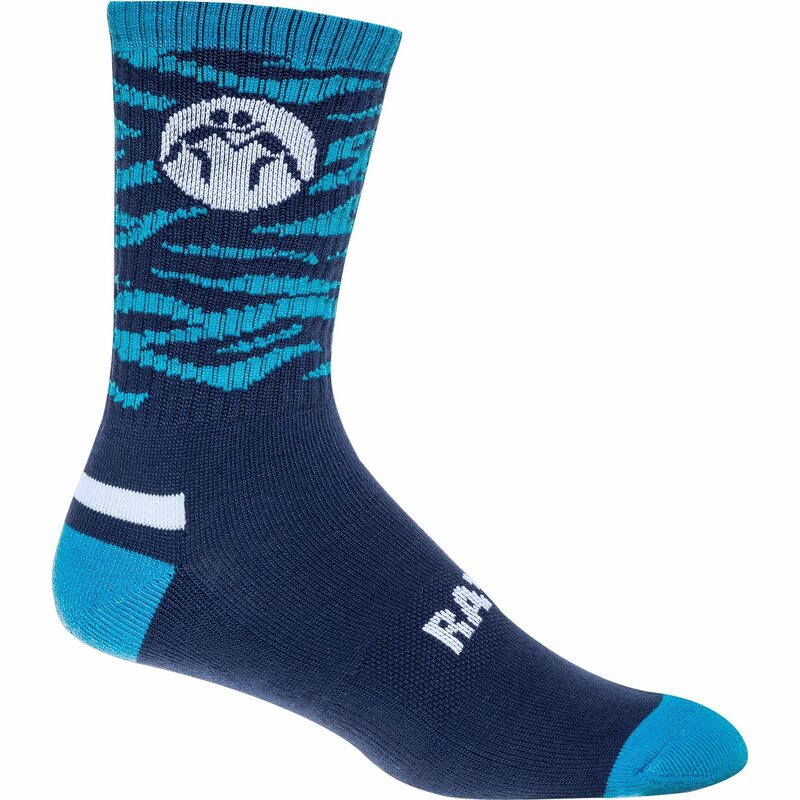 Our socks come in a huge assortment of colors and designs, and our collection is constantly expanding. 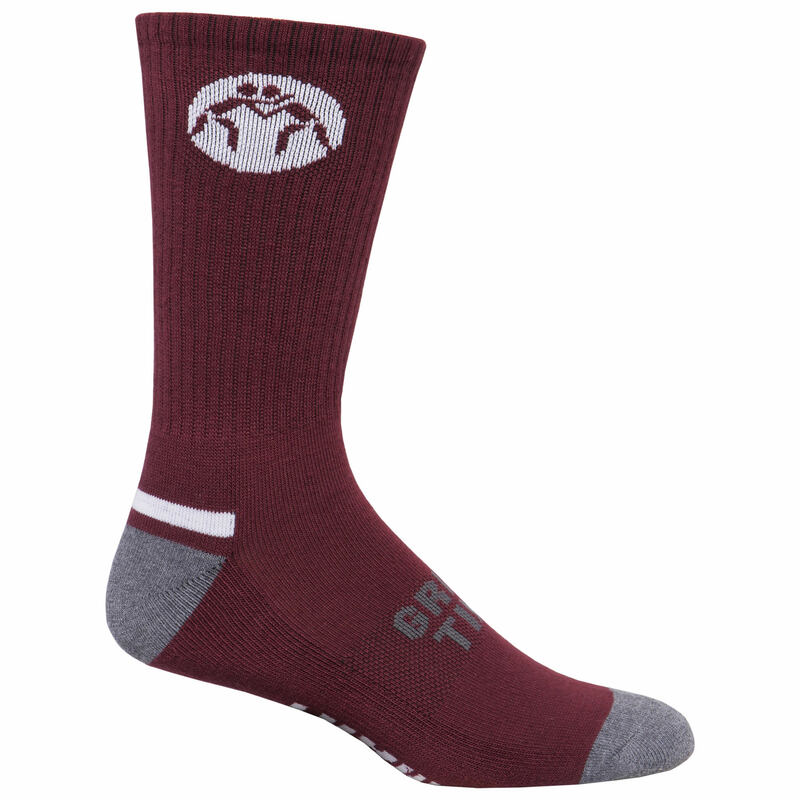 The standard “Performance Sock” design comes in all the common team colors, so you can truly match your teammates from head to toe during those dual-meet faceoffs. Each one has a unique phrase on the toe, which makes them fun to collect. 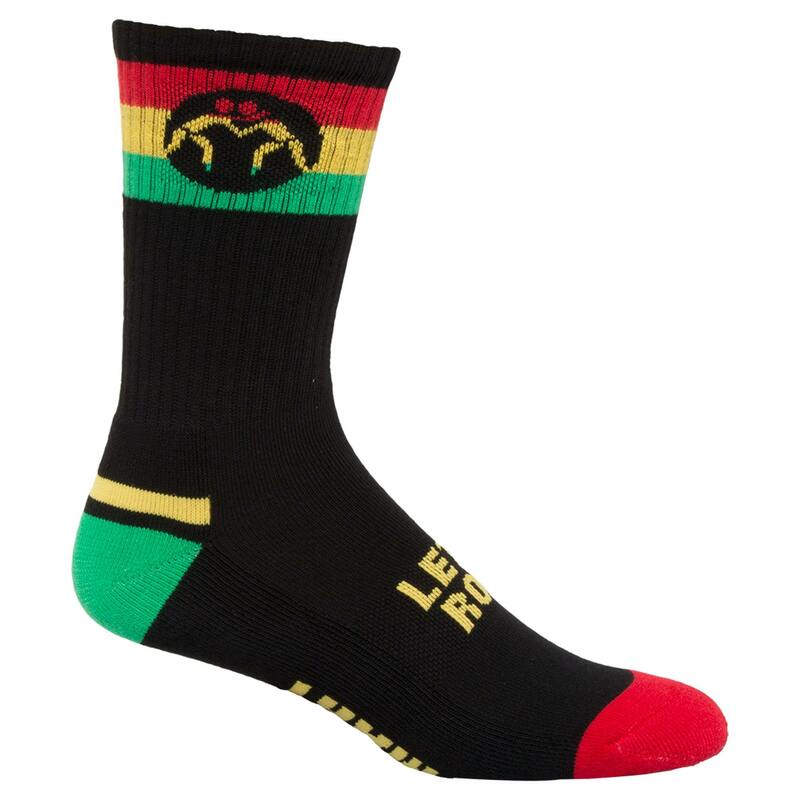 We also have many design-oriented socks like USA and California themed socks and even more funky styles like our Rasta and Lightning Bolt patterns. We are always trying to come up with new colors and designs that our customers will love. 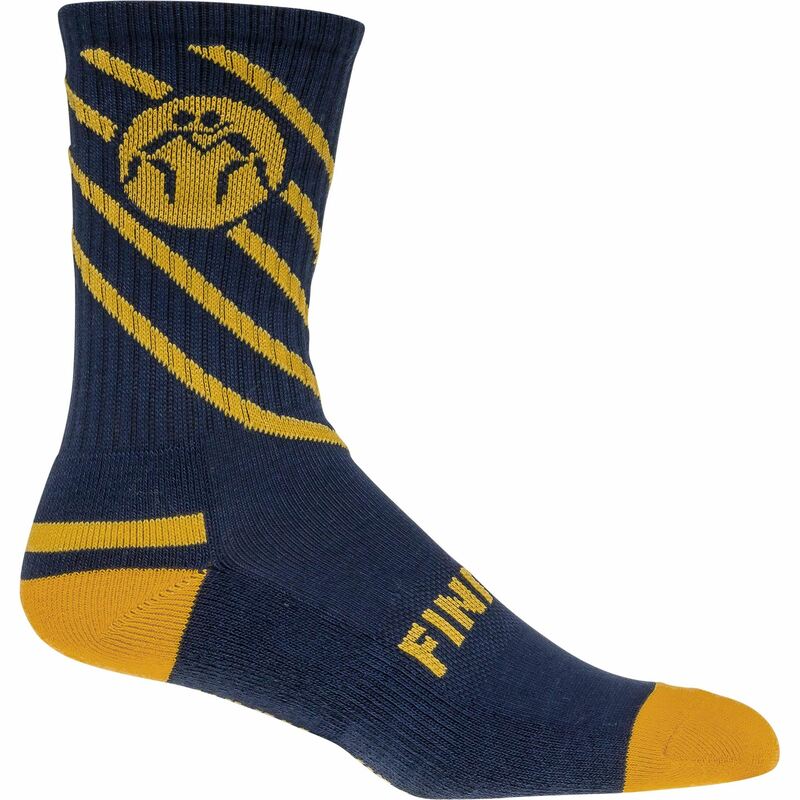 So, if there is anything that you want to see in our Wrestling Sock Line, please let us know! You know the famous Dan Gable quote “Once you have wrestled, everything else in life is easy.”? Well that applies here too. 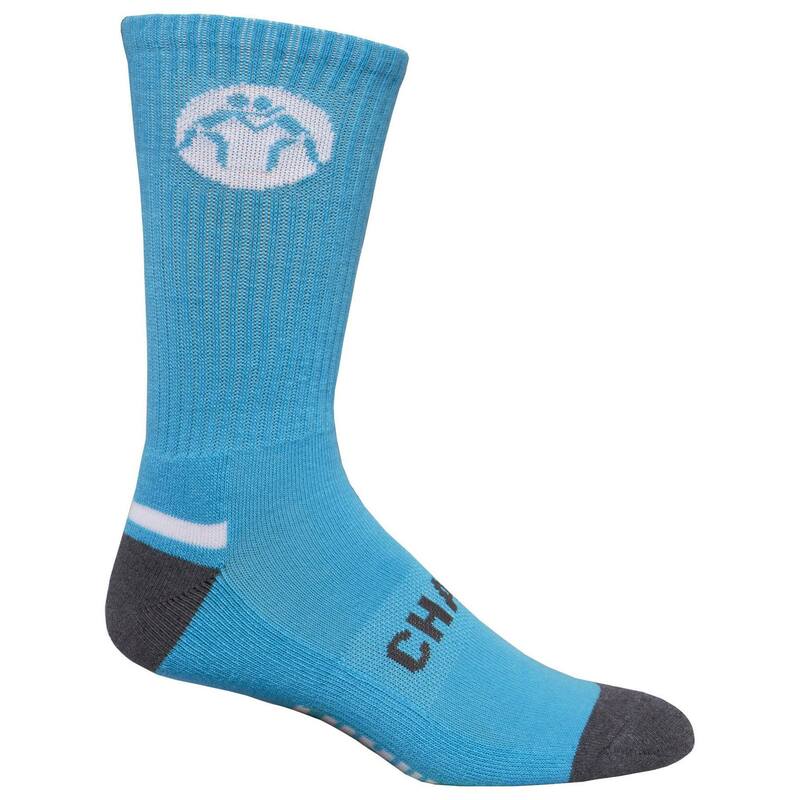 Since we made the perfect sock for the world’s toughest sport, they have also been a favorite for our customers who enjoy other activities, such as hiking, running, carrying logs up hills, and bear wrestling. 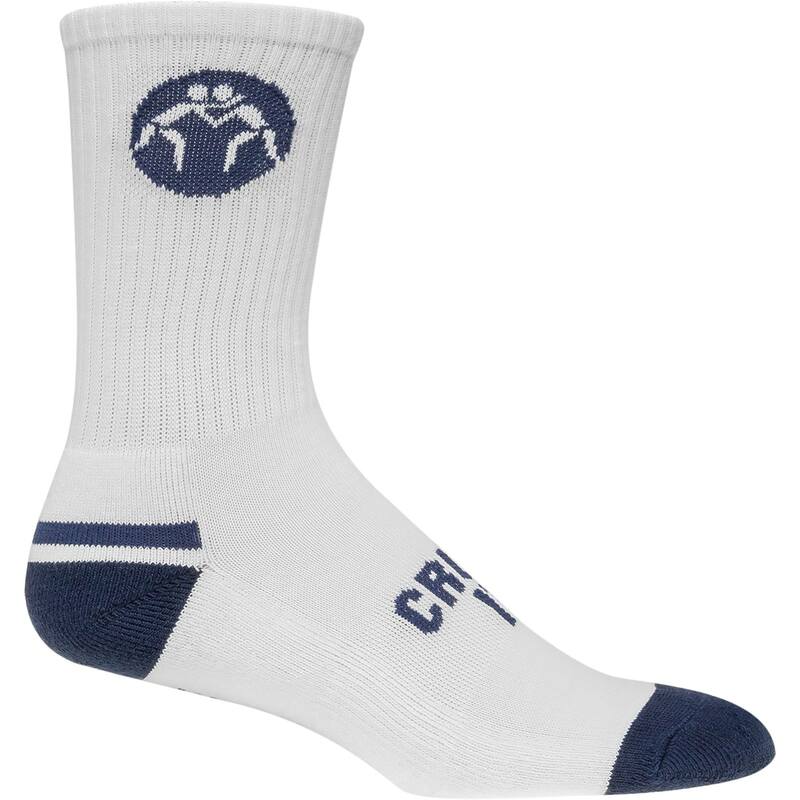 We hope that you’re as crazy about our wrestling socks as we are, and wear them everywhere you go. Of course, the best use for them is wrestling, the only activity in life that truly matters. Most comfortable $5 socks i have ever bought.. thats the main reason i keep buying more.. 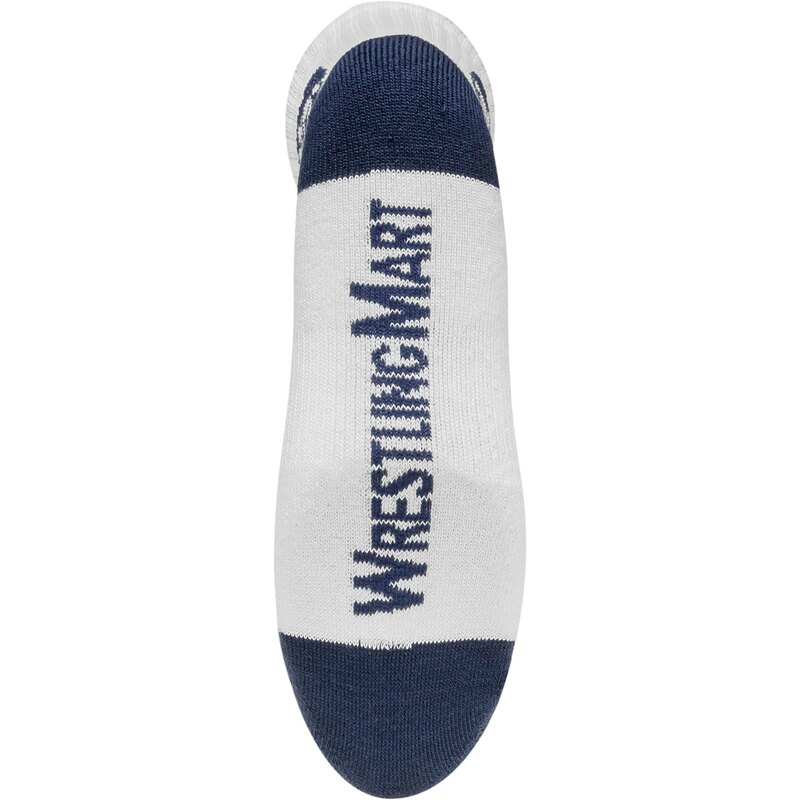 The WrestlingMart "Just Wrestle" socks are soft and thick so your feet don't hurt. I would recommend them! 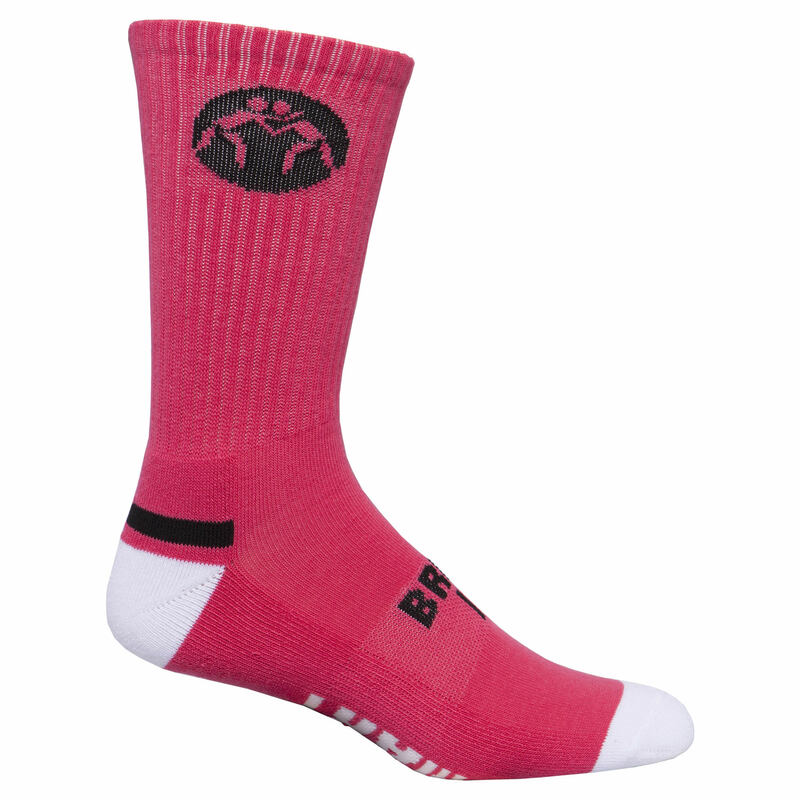 The Pink "Bing It" sock is very comfortable and thick so they are good for practice. They are so pretty. It is a very good sock. 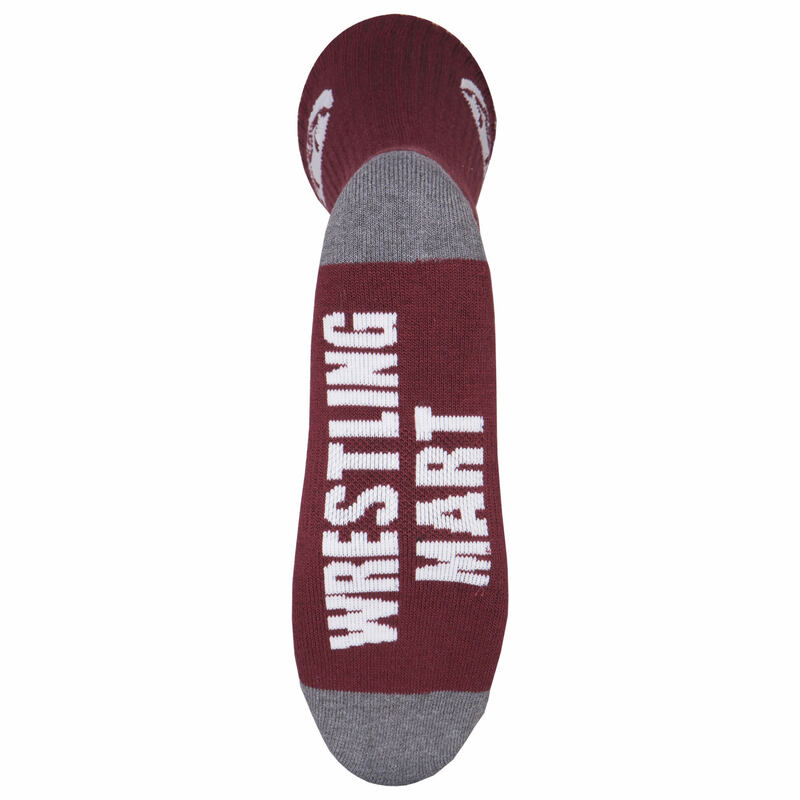 WrestlingMart Socks Pros: Very comfortable; many different colorways; very durable. These socks are very creative and "fly". They're isn't a single flaw. 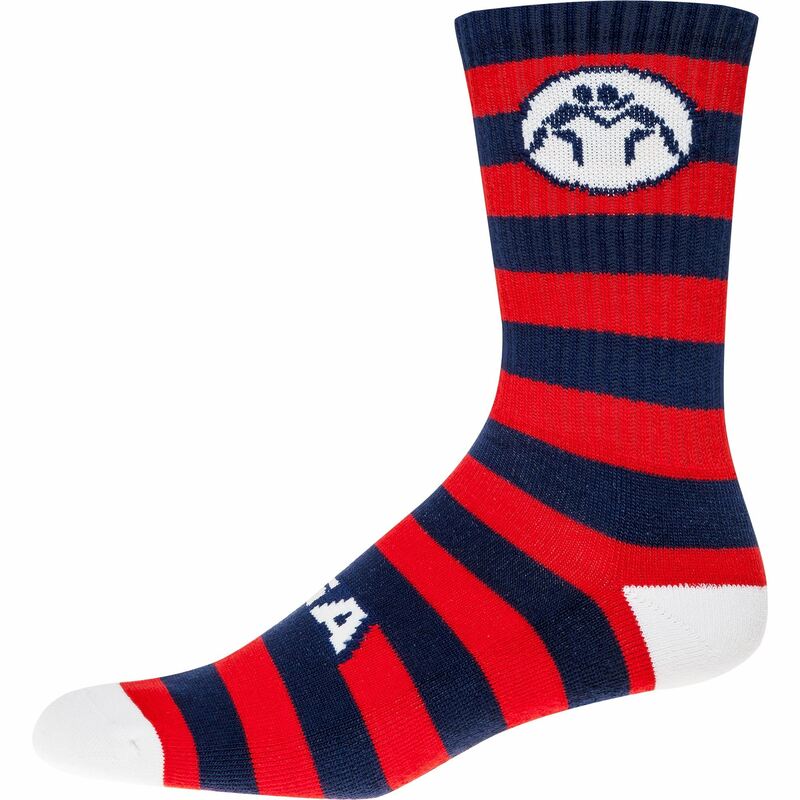 Wrestling socks are very comfortable and stylish! I felt them and they were really soft. I can't wait to try them on the mat! I like the variety of colors and how they look. Comfortable, great material, and has great quotes! 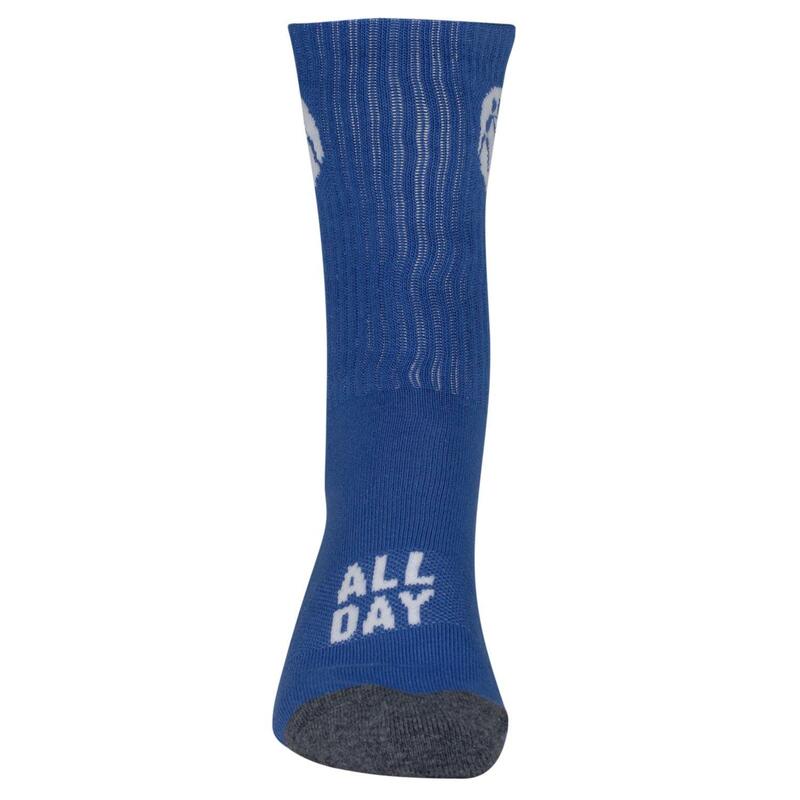 These socks are perfect for long days at tournaments. hey provide plenty of cushion and support even after long wear. For the price they can't be beat for such good quality. They look great and stand out. They have any color you want and super comfy! The socks were super comfortable and soft. They never got any holes. Comfy - takes the sock game to the next level! 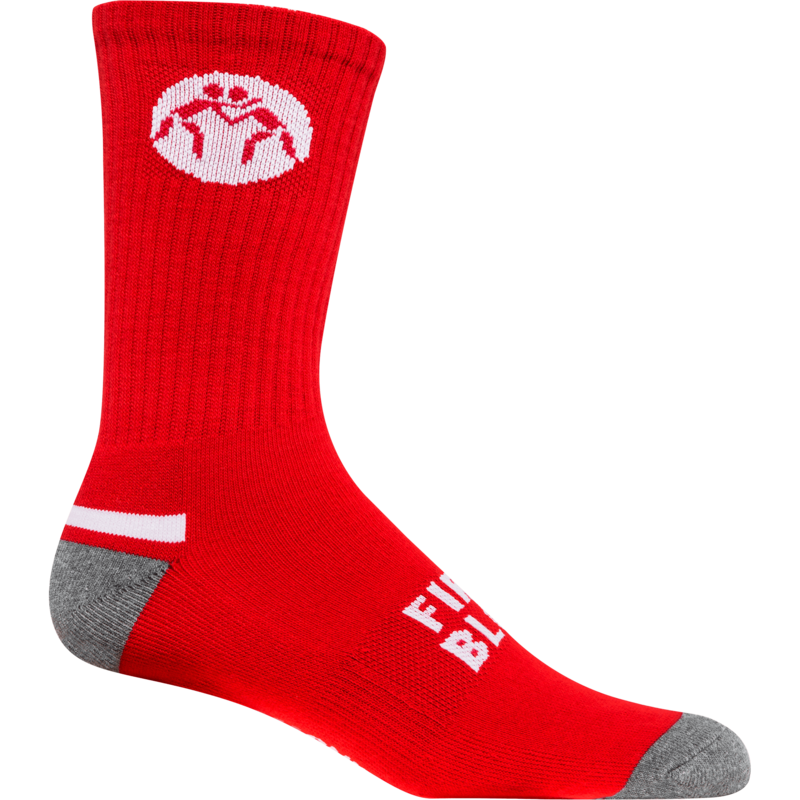 The socks come in many varieties and it helps match with singlets. 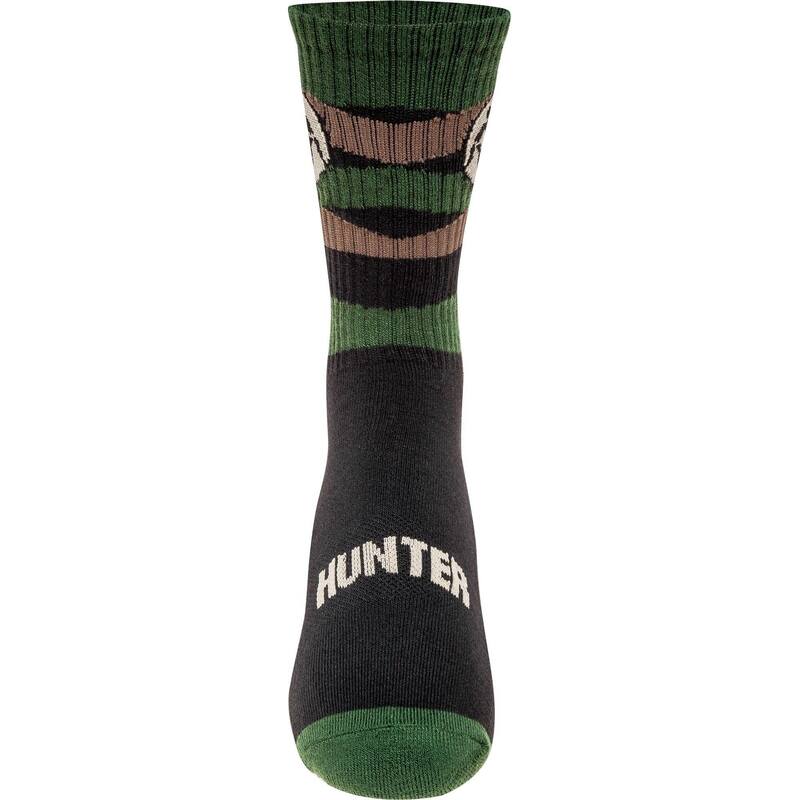 "Hunter" Socks- texture is soft and feels squishy with every step. Socks don't fall down easy and have very cool pattern. Take advantage of 3 for $12! 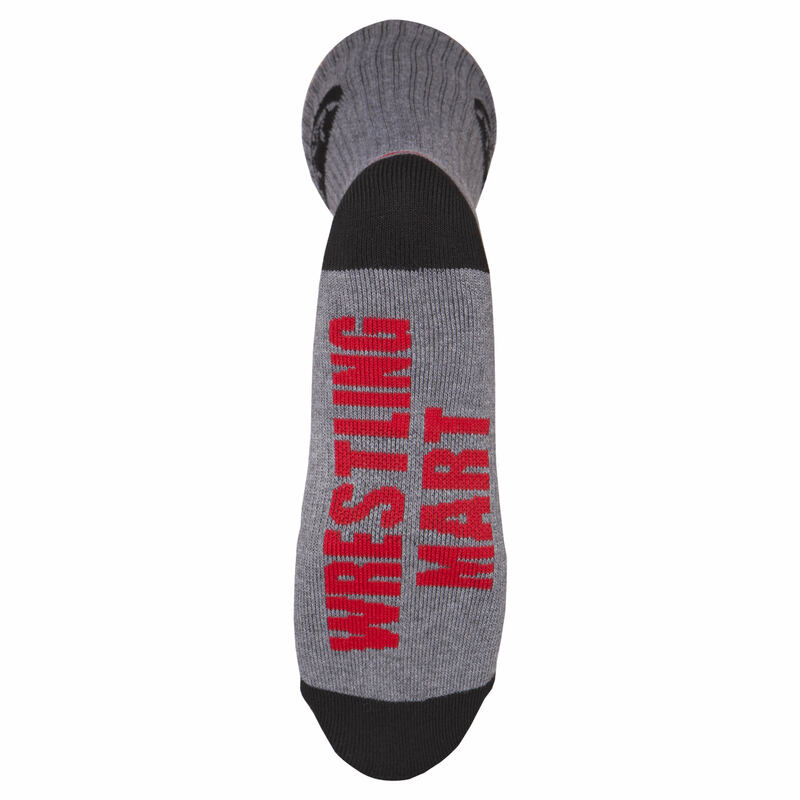 WrestlingMart socks are very comfy and never shrink. If you were to sweat in them, they handle sweat great. Don't just buy one pair!! Buy multiple pairs! 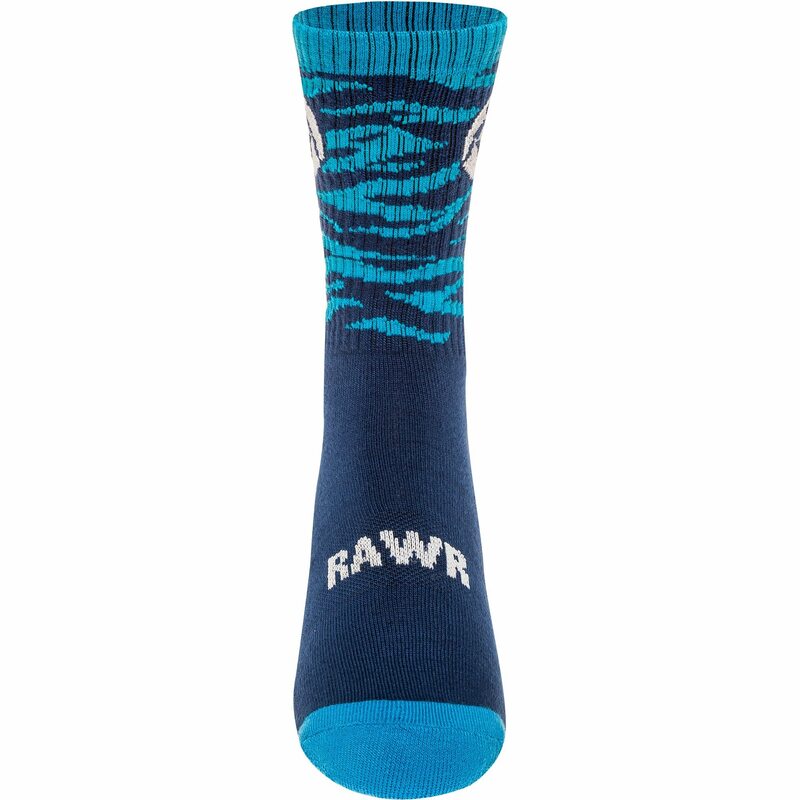 "Rawr" Sock - Super stylish socks and very comfortable. 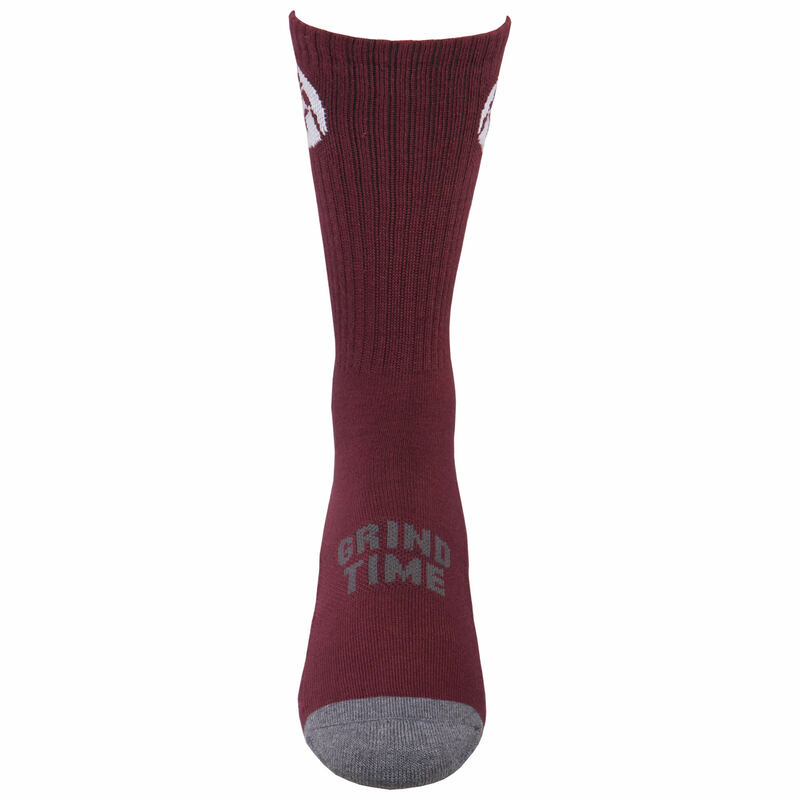 "Bring It" sock. Very comfortable and long lasting. Love em! They're super thick and provide great warmth. Love the colors! Gives a cooler style with my shoes and very comfortable. These socks are very comfortable. They are good quality and last for hundreds of washes. Great, durable socks. My son likes them so much, they are his everyday socks, not just for wrestling. Socks are perfect thickness to make your shoes snug. Allows air flow to dry them in-between matches as well. 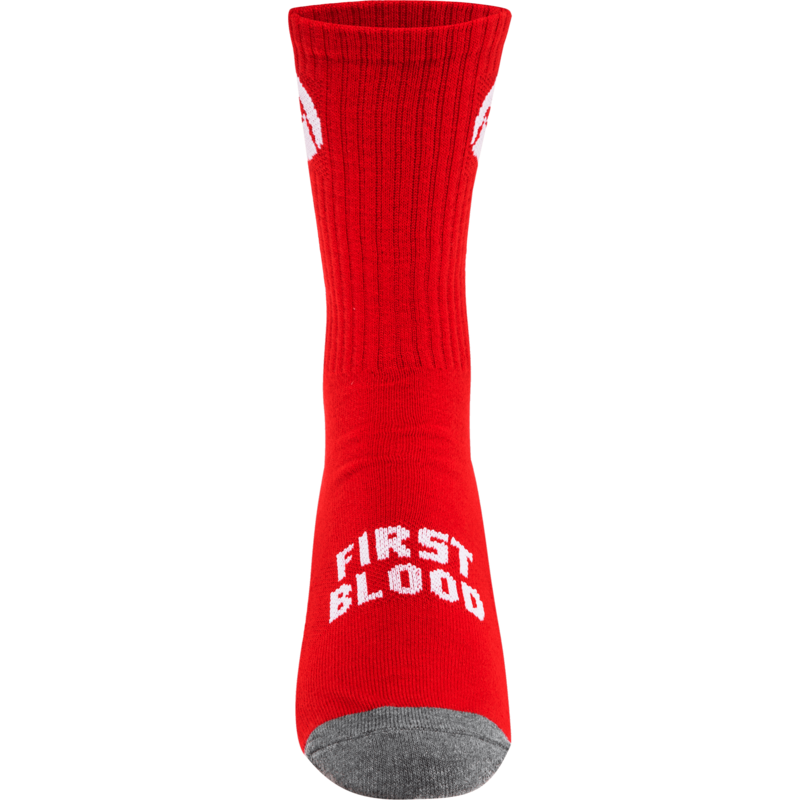 The red "First Blood" socks are very comfortable, and they feel good to practice and wrestle in. Love these socks, they’re so cheap but are so sick. Comfortable and soft! People at tournaments love them. 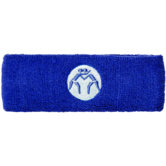 Durable, holds elasticity and color. Plus they are comfortable. Excellent and for the price, can't beat them! 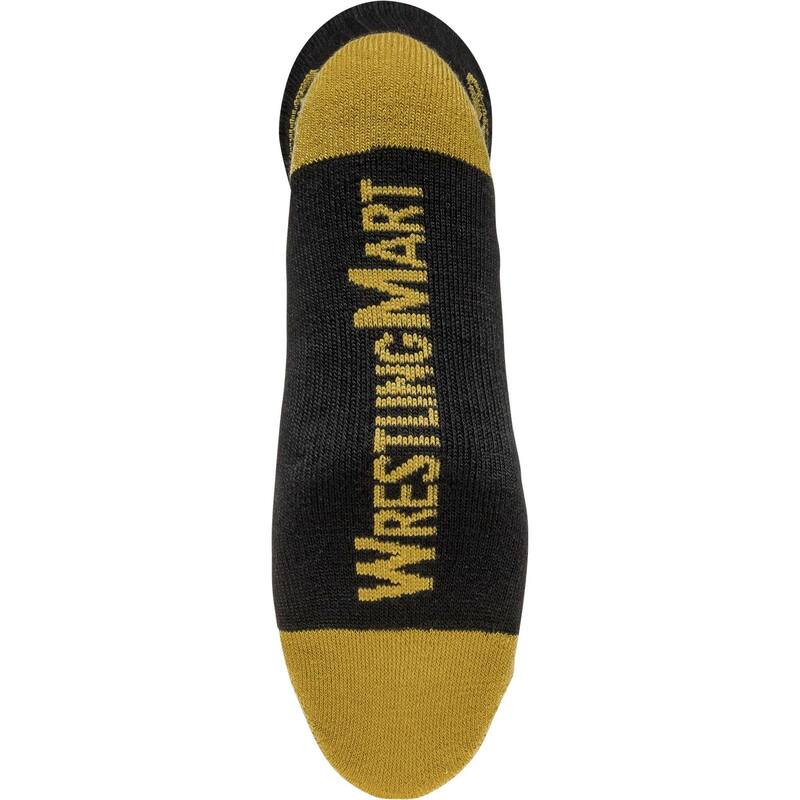 I like WrestlingMart socks because they come in almost any color. I also like them because they slip in the wrestling shoes really smoothly. Overall they're really comfortable to wrestle in. Fit was perfect and comes in about every color possible. Very breathable.Totally would recommend. They are very comfortable with a nice design. These socks are comfortable and soft. They feel good paired with wrestling shoes. 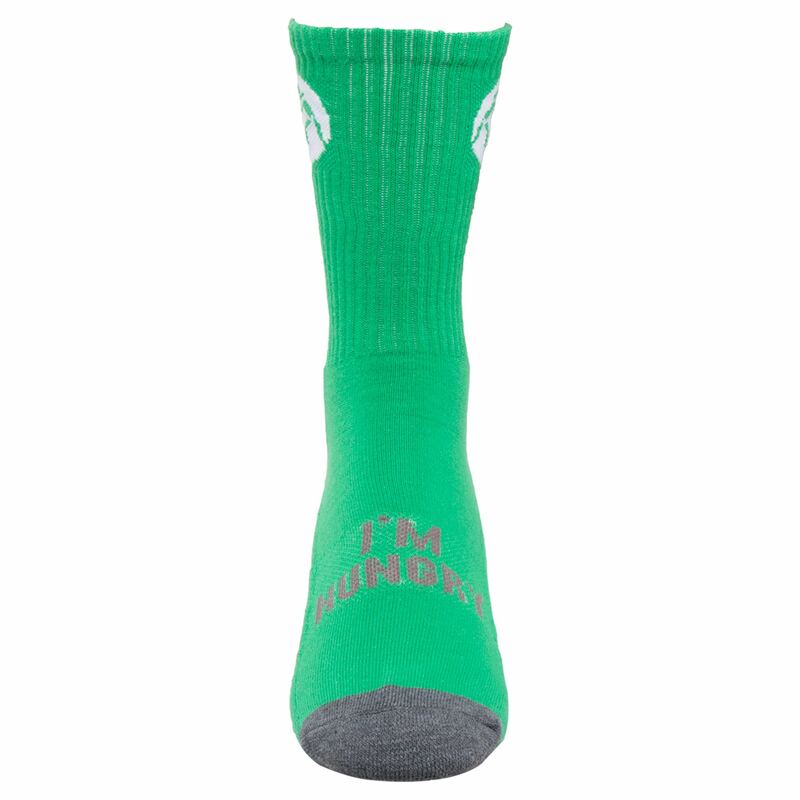 I like the clever phrases on the socks along with the colors. Socks are perfect fit. Love the compression around the arch - makes for a more comfortable fit. 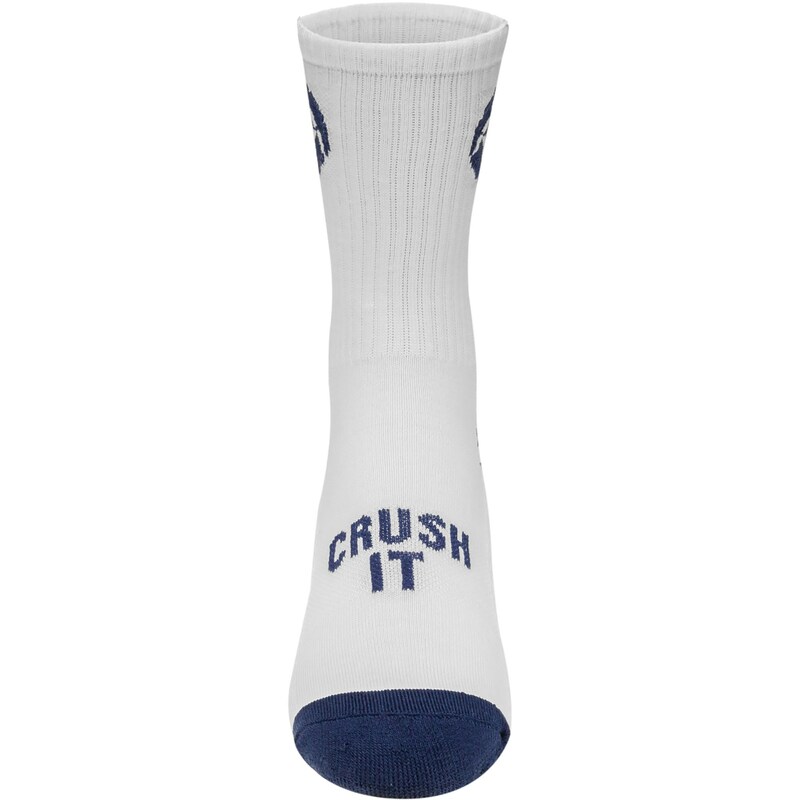 I love the motivational sayings on the socks and they are comfortable. Great colors that hod through washes. They stay on the foot nicely. We are addicted to wearing these socks! Not only is my grandson wearing them with pride, so am I!! Service is always excellent at WrestlingMart!!! 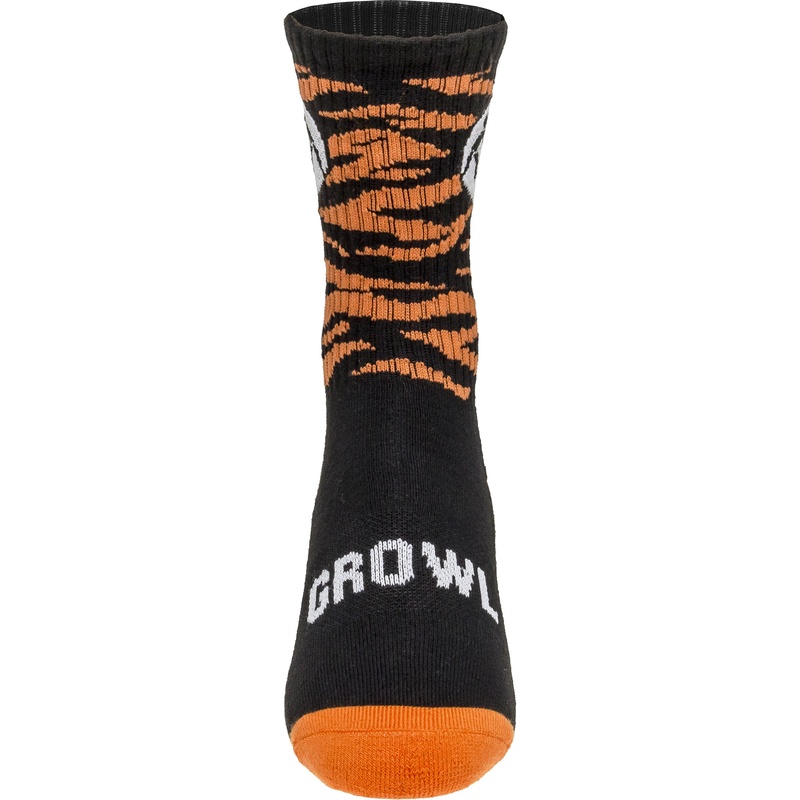 Rawr Socks: The sock colors are very bright and the material is comfortable. The design is very nice and the pattern is very soothing. Great colors that hold up through washes! They stay on the foot nicely in the boot!! Would recommend. The socks are super comfortable and good for wrestling all day. 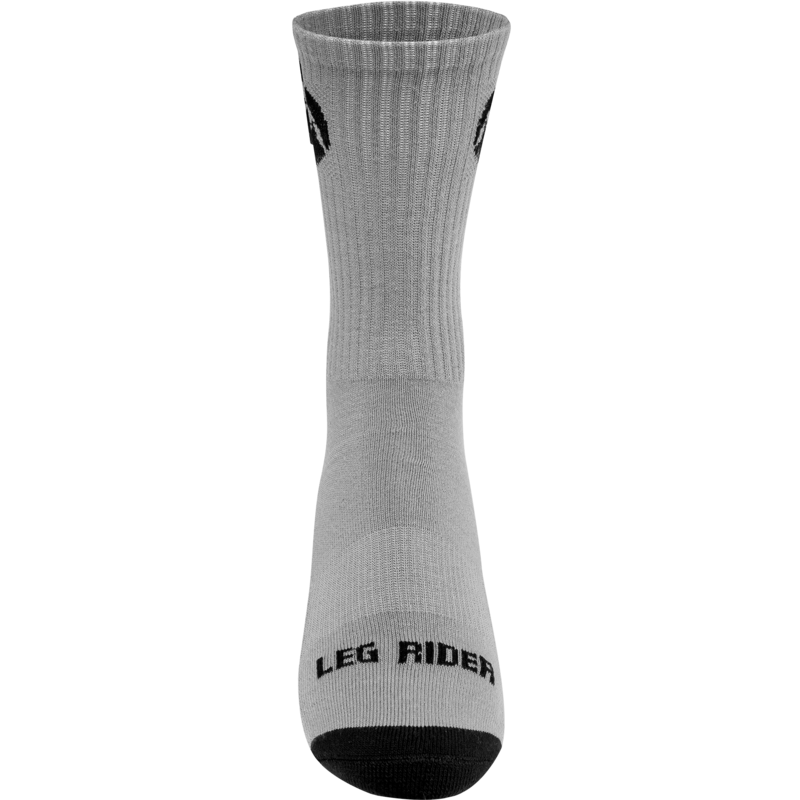 These socks are very comfortable and good socks for long tournaments. Your feet will not get hot or sweat at all. They are good for both everyday life and wrestling. 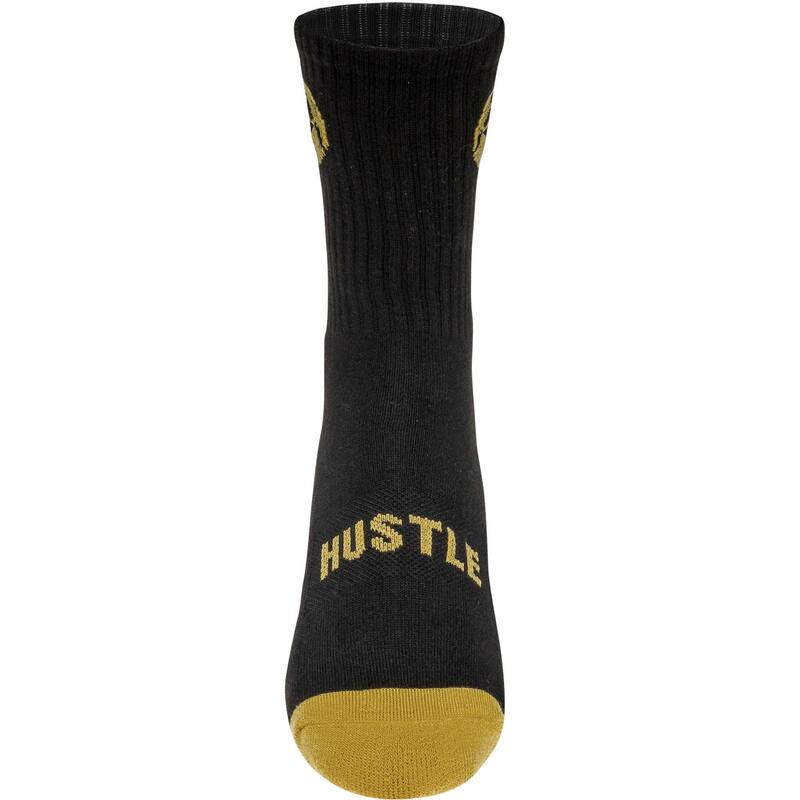 These socks would probably beat out other branded socks like Nike and Adidas. 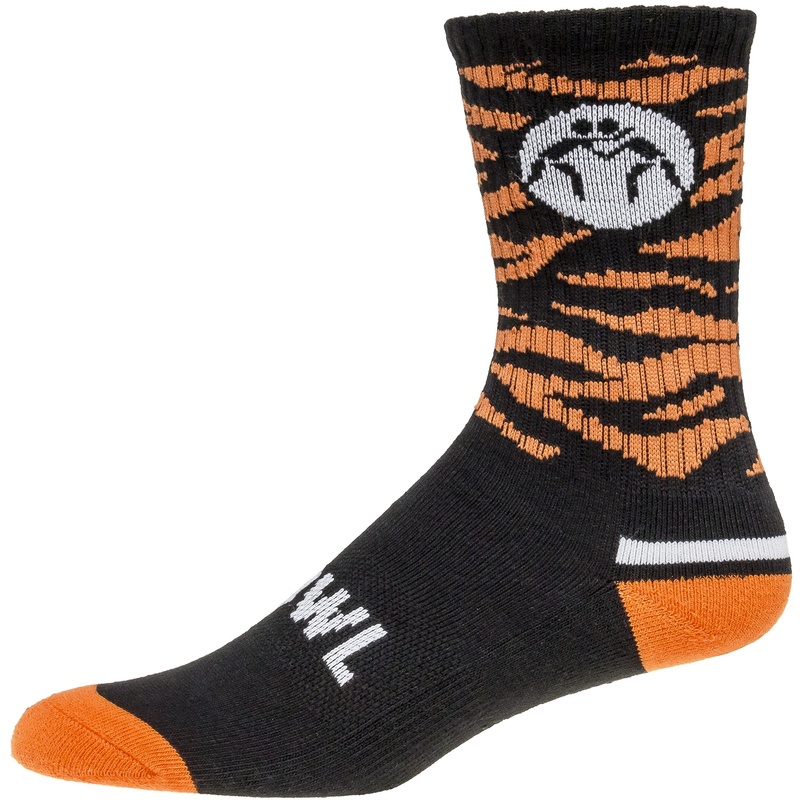 Not only are they comfortable but you can also let people know your sport is wrestling. The socks are of high quality. The quotes and different colorways make them unique. However, I don't know if it's just me, but the inside of the socks sometimes start to wear down and some fabric strings get caught. These socks are so cool! I'll make sock puppets out of them. 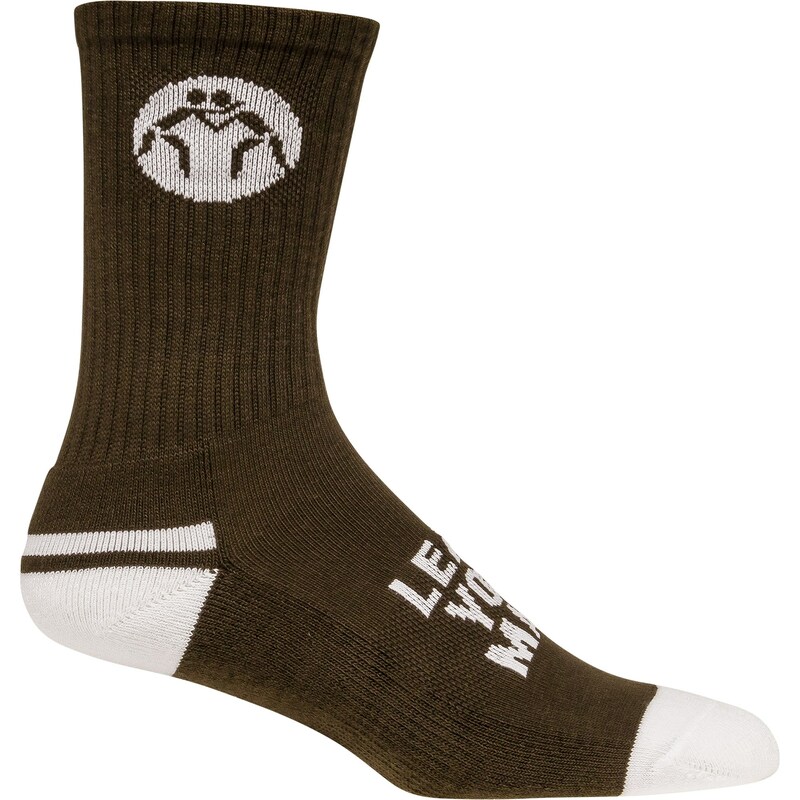 The socks are extremely comfortable and soft! Love the colors. If I could buy all of the different color styles I would! Love it! 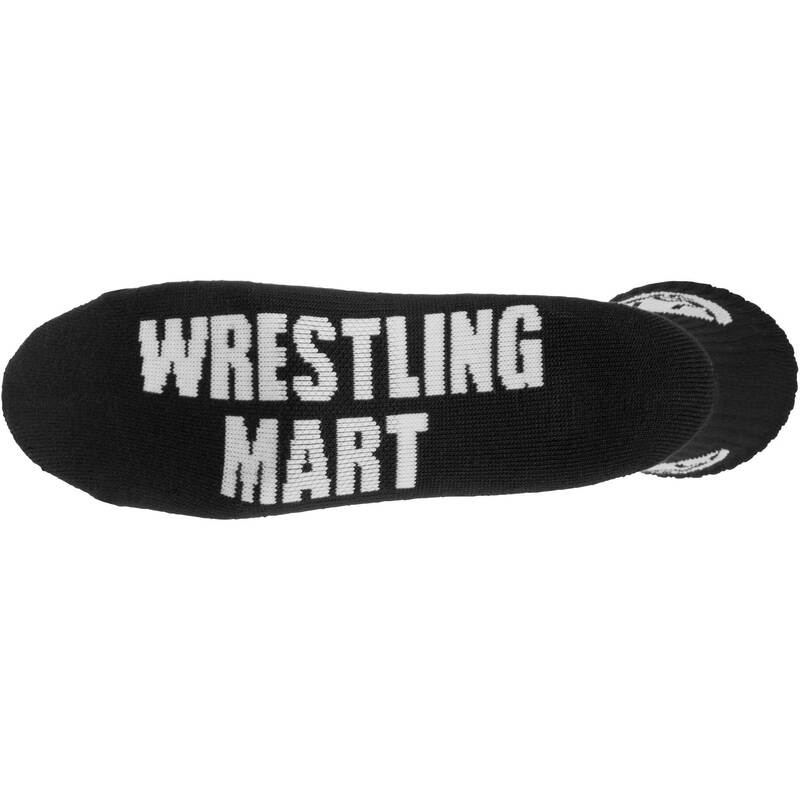 The WrestlingMart socks are very comfortable. 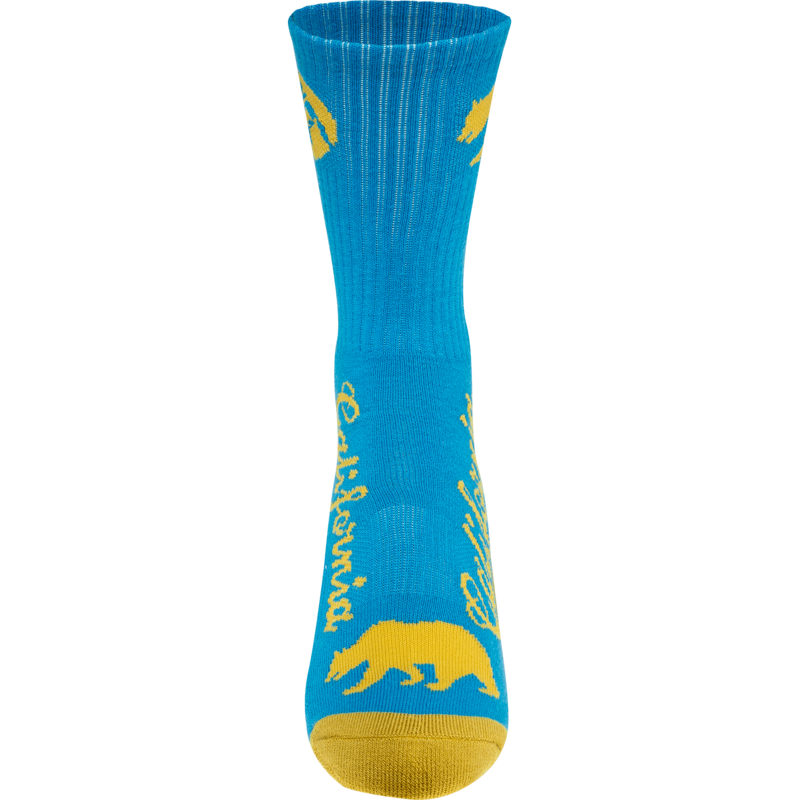 There are so many cool designs on the socks and various colors. These socks also fit very well. The socks feel comfortable. They protect my feet from blisters. Very popular! We have them because they are very good quality. The color variety is great and our sons have every color. It feels great and still does, but some of them rip at the bottom. That's because I wear wrestling socks every day. 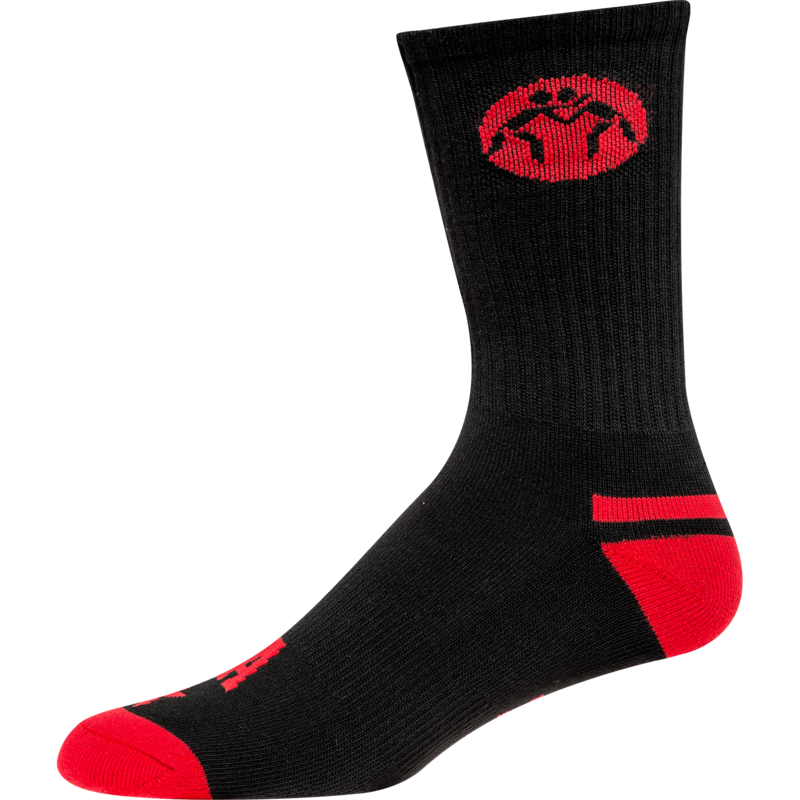 These socks have a good selection of colors and styles, and they are the most comfortable socks I've ever worn. 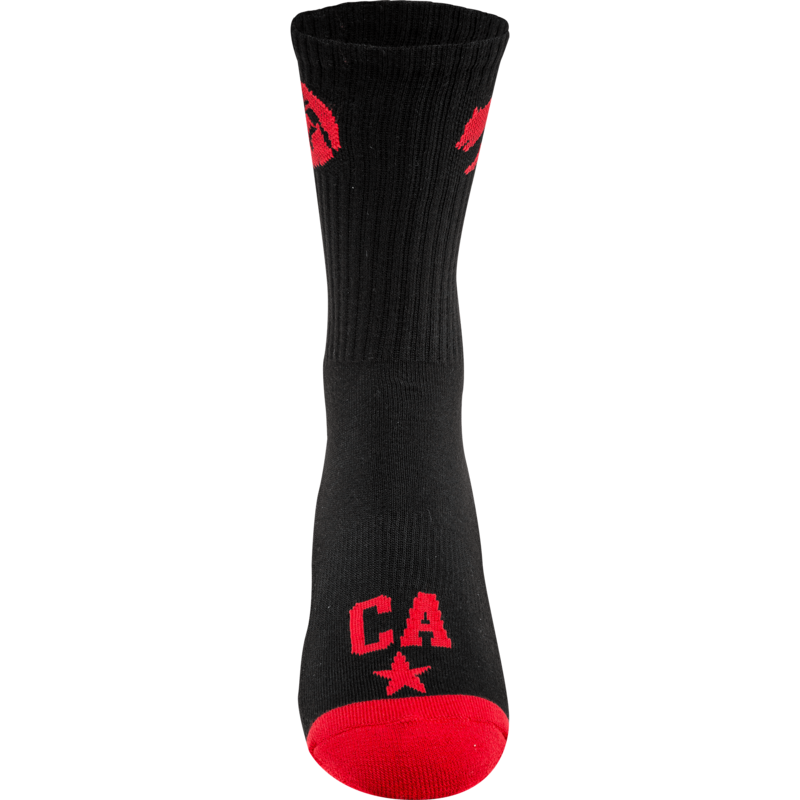 These socks are some of the best I have ever bought and definitely the cheapest at this quality. The thickness is perfect for wrestling and running shoes. 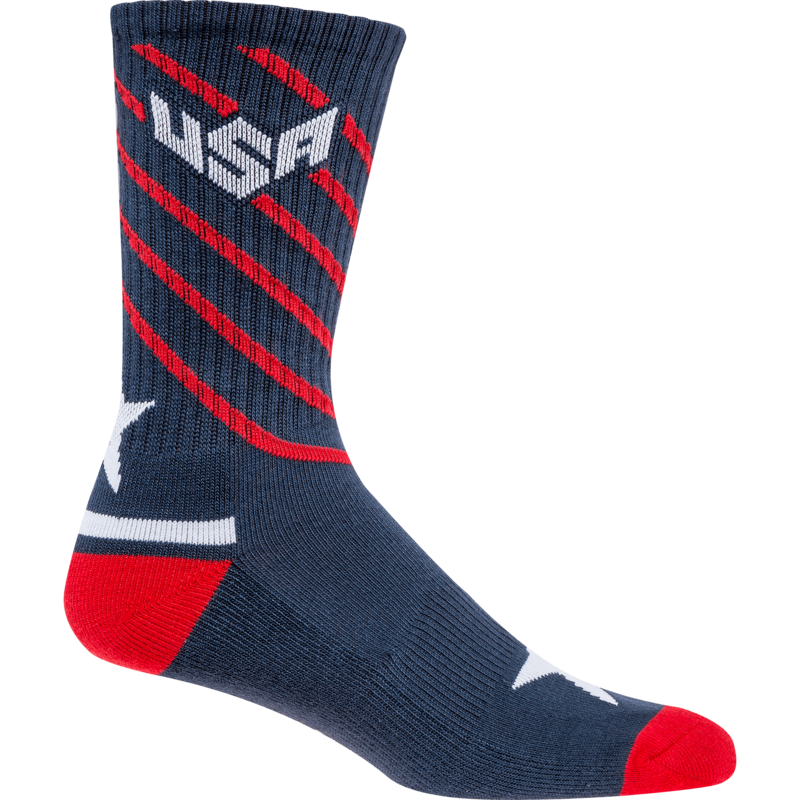 The best part though (I think especially for wrestlers with thick legs) is that these are very stretchy in the calf and didn't distort the USA logo at all and I only ordered a medium. Bought these for my teenagers who wrestle. They love them . They are super comfortable . Easy to get on and they stay up. It’s hard to get good fitting socks for kids with big wide feet! The stuff arrived fast too! These socks are comfortable, clean, fun, and hold up (stay up) perfectly with their elastic top, and provide the perfect amount of support. Cozy and comfortable. Large variety I could choose from. 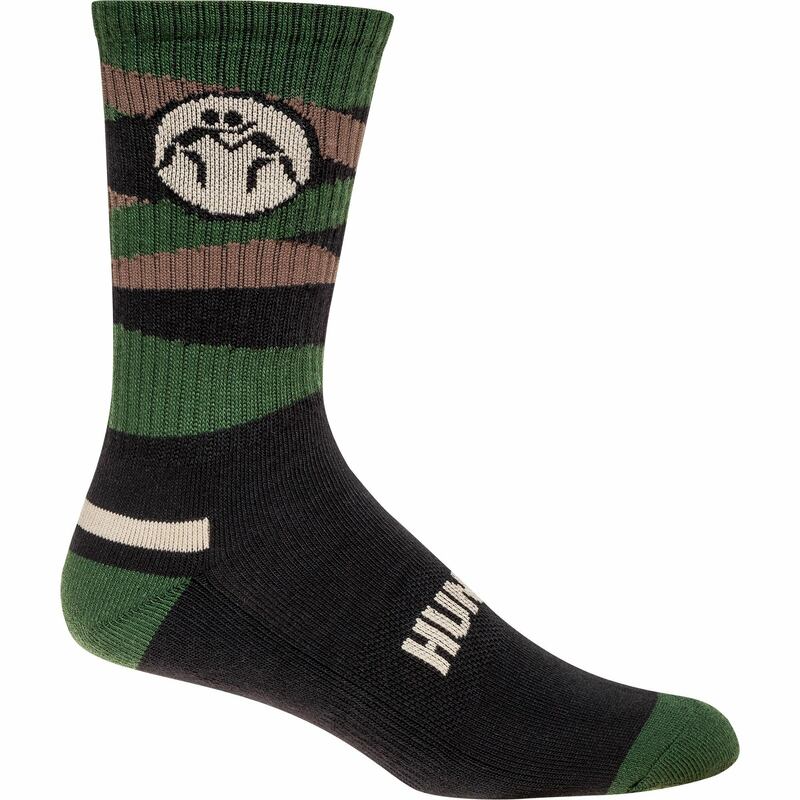 All socks are durable to last long. Super awesome! So many designs. 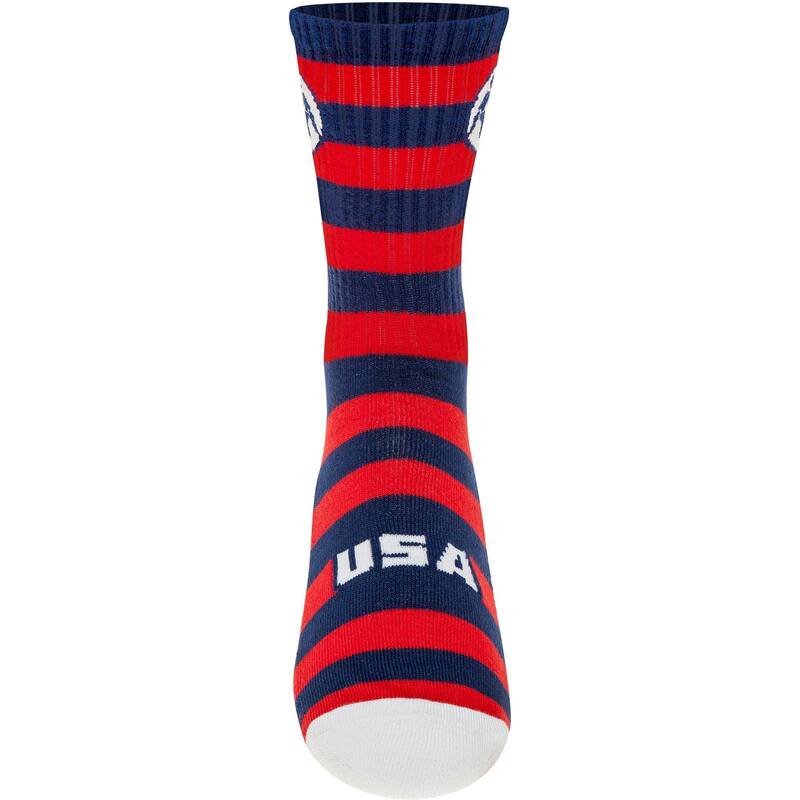 Favorite pair is the USA ones by Varner - look really awesome. I have several pairs already. Got more on the way. Feel great to workout in and day to day use. 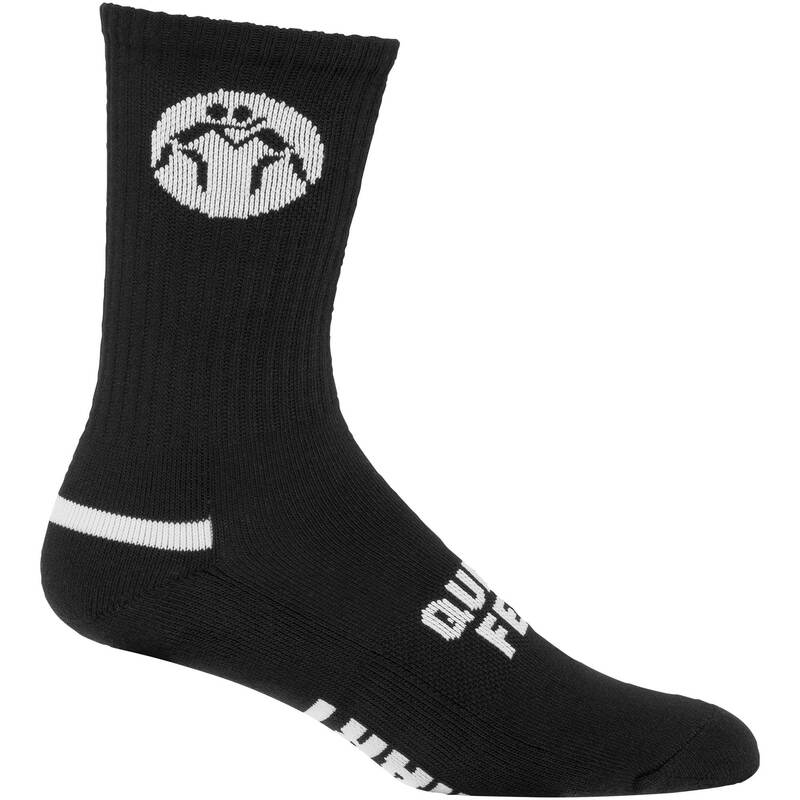 Fit big calves, very breathable and doesn't suffocate my legs. They match my singlet and I love the varieties. Very good quality. Very good selection and colors. More toe support. Ripped after 6th wear on the "Just wrestle" logo item. 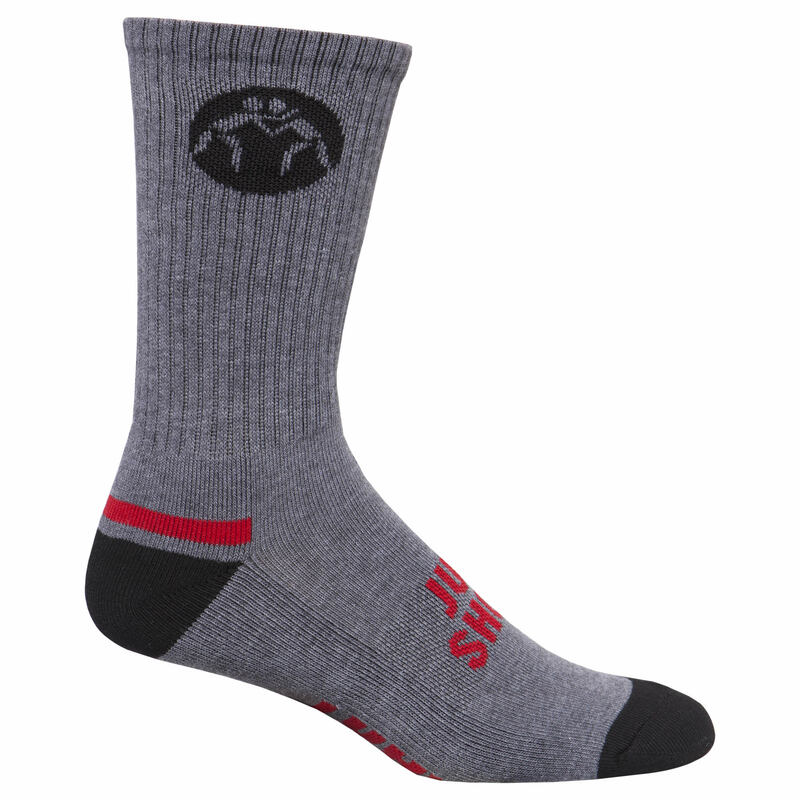 The WrestlingMart socks are super soft and unbelievebly comfortable! 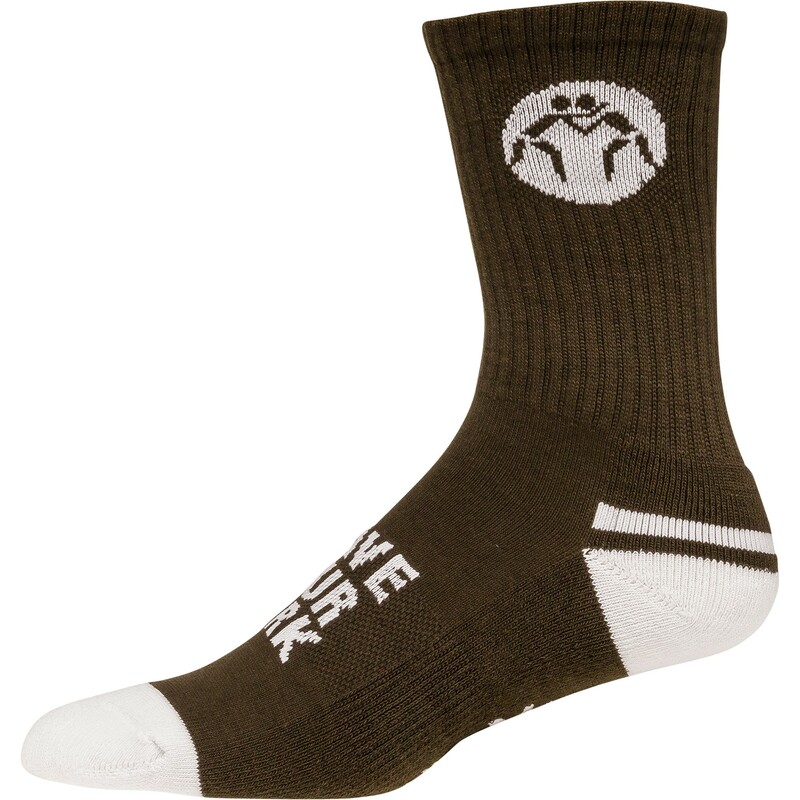 The socks are very comfortable and durable. They are very lightweight and strong. They are long lasting. They also look good. I like these socks because they are very comfortable, luxurious and the perfect Christmas gift! 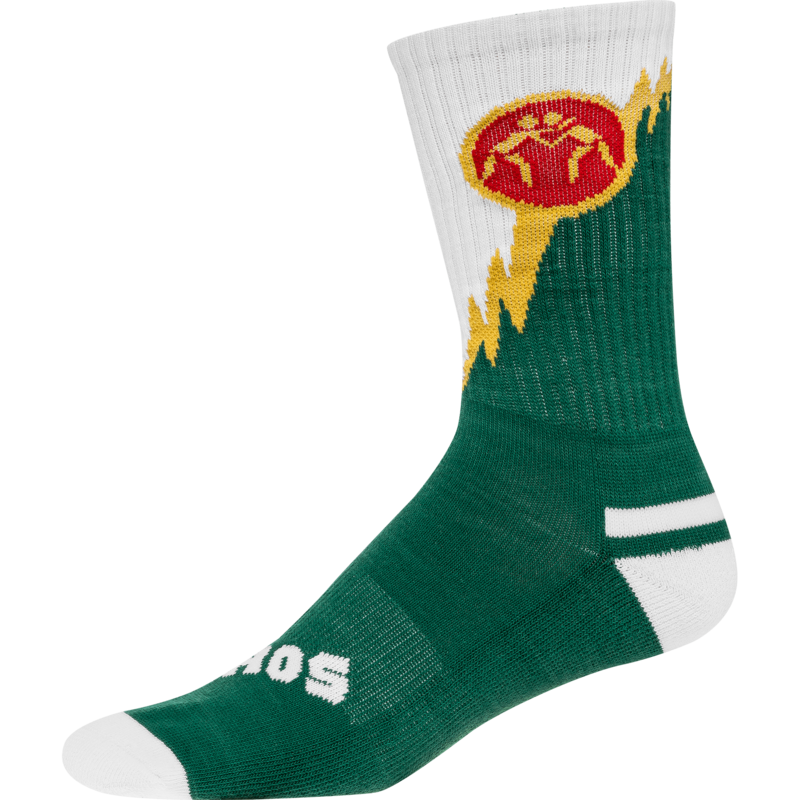 If you were to get these beautiful socks, you would fall under the title of a pro-wrestler. I mean, that's if you want to be a pro. If you want to be a pro, do like a pro - get the socks! The socks look amazing. They are comfortable and very stylish. They fit awesome and look super cool. The designs are well thought-out and creative. The help was great. 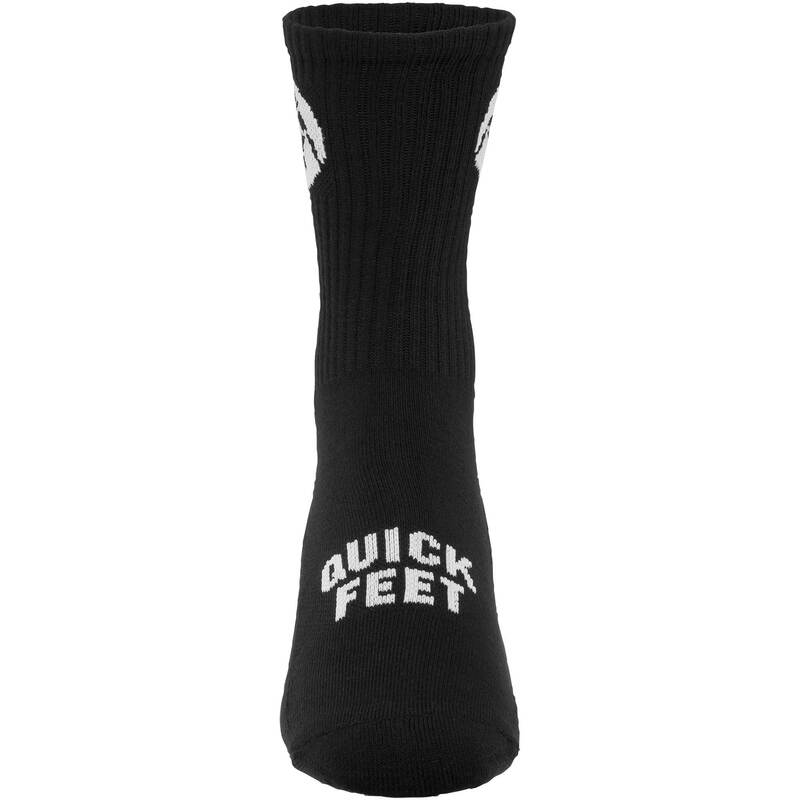 There is a wide variety of sizes and styles of socks. They are soft and very comfortable to wear. 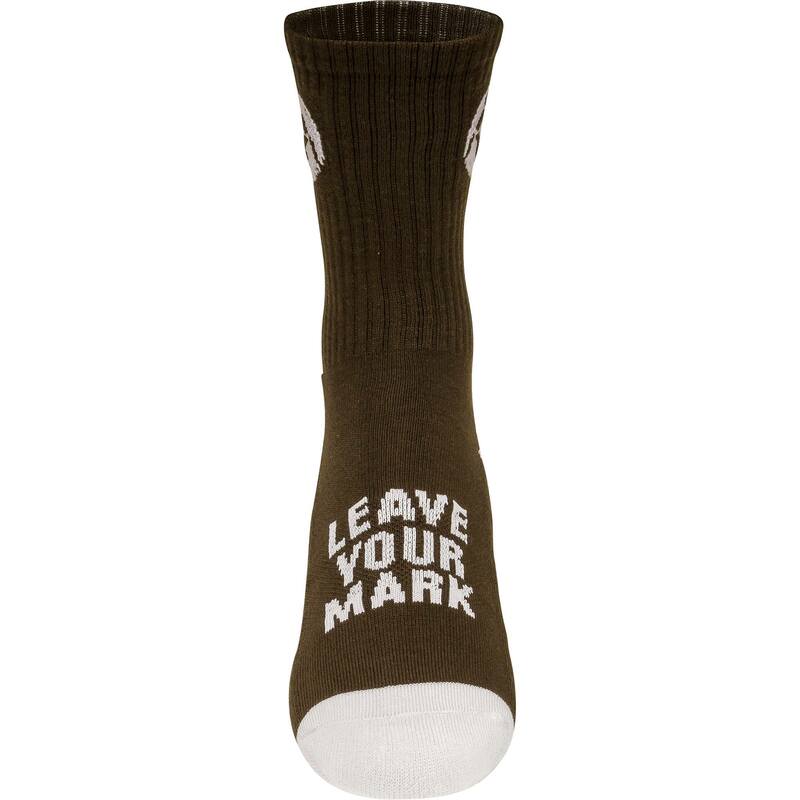 They also have a variety of phrases on the socks. The socks look and feel great! They are very comfortable when you wear them. There are a wide variety of colors and sizes. They are great to wrestle in. This store has every thing you need to be a wrestling champion. From Socks to Shoes they're very nice. The singlets are cool and they have every size you need. They have tape and mouth pieces for safety precautions. This is the best place to shop if you are looking for the best wrestling gear. 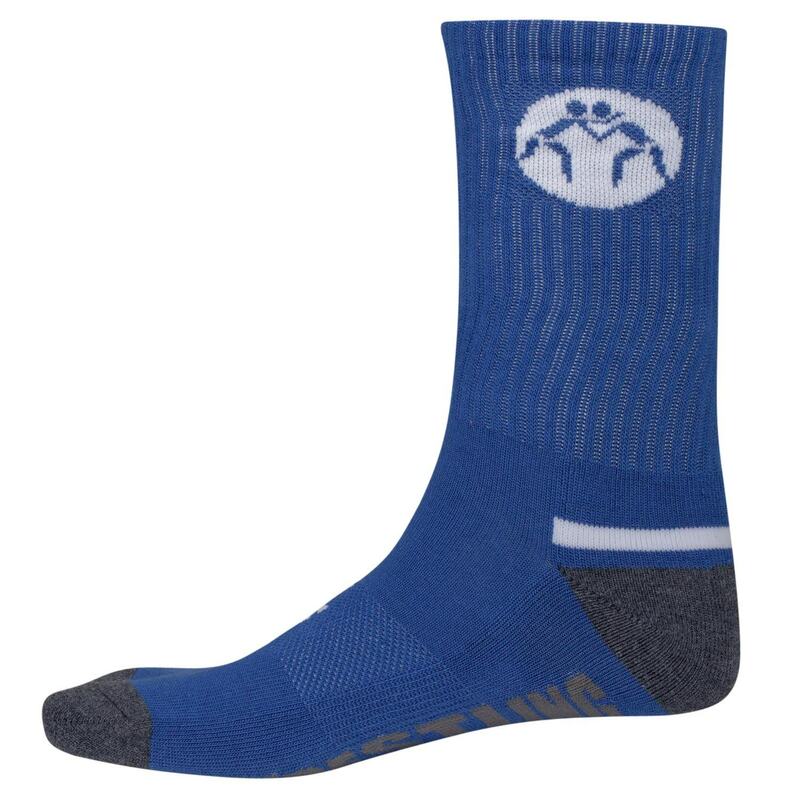 These performance socks are very comfortable and protect the foot very well. I like the colors and they go well with any shoe. 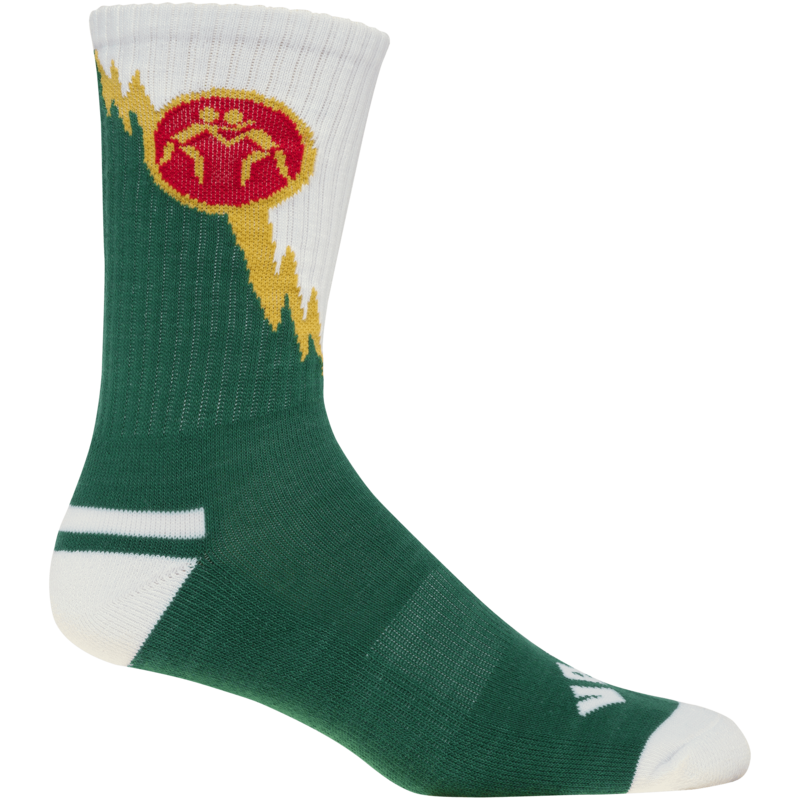 They are one of the best socks I have owned for wrestling. I would recommend these socks to any wrestler. Love these socks! They don't shrink or fade, and look good time and time again. Also your feet don't sweat or smell. I always need more colors! Very comfortable and easy to put on. Love them! Socks are a great deal! You can get every color and not break the bank. 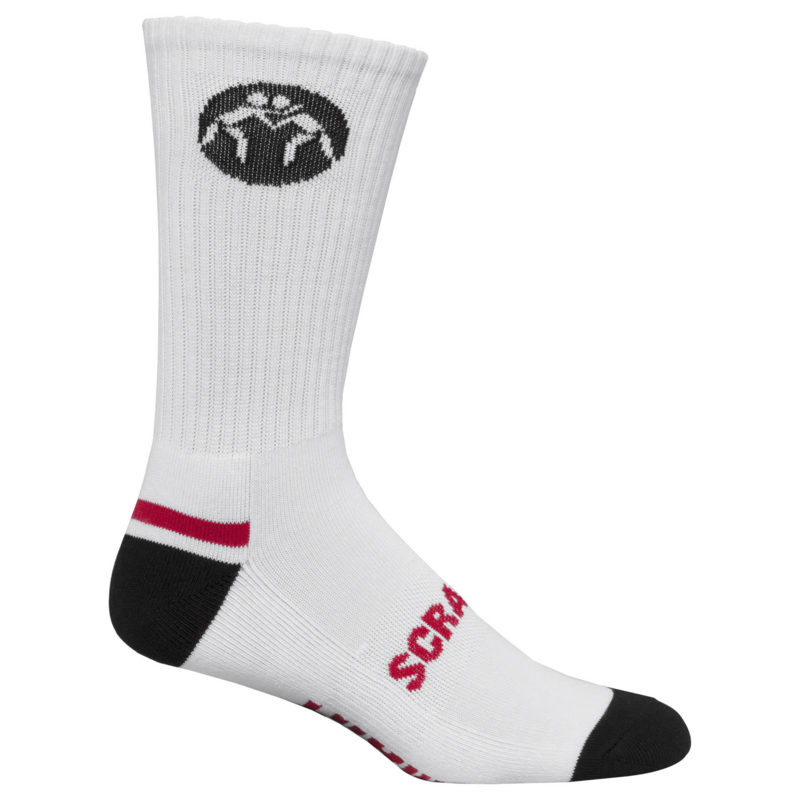 What wrestler does not like the socks! 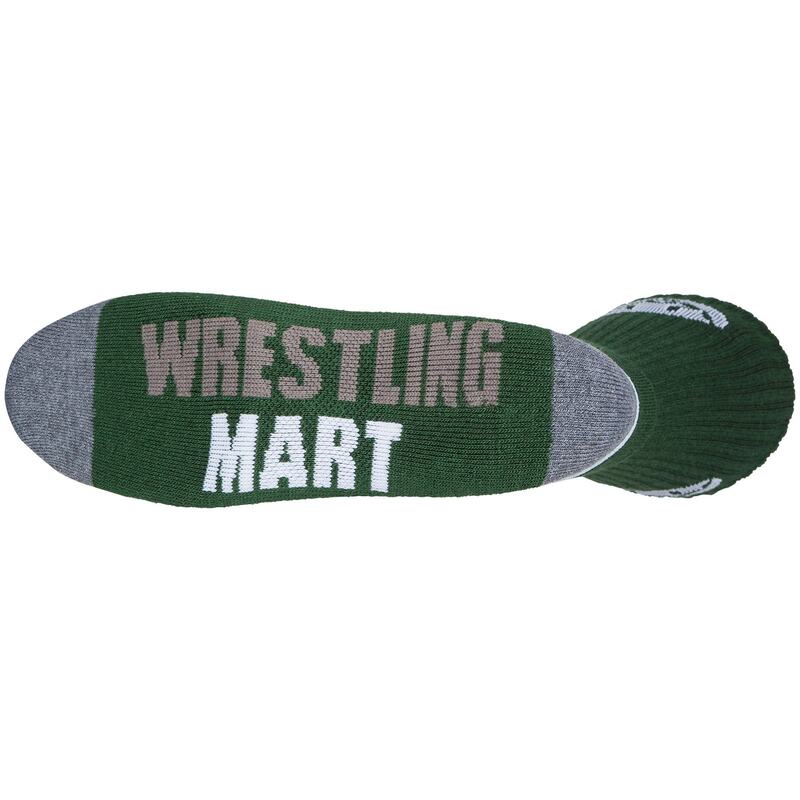 WrestlingMart is a one stop for all wrestlers! You must visit! Soft, comfortable, and keep their shape. 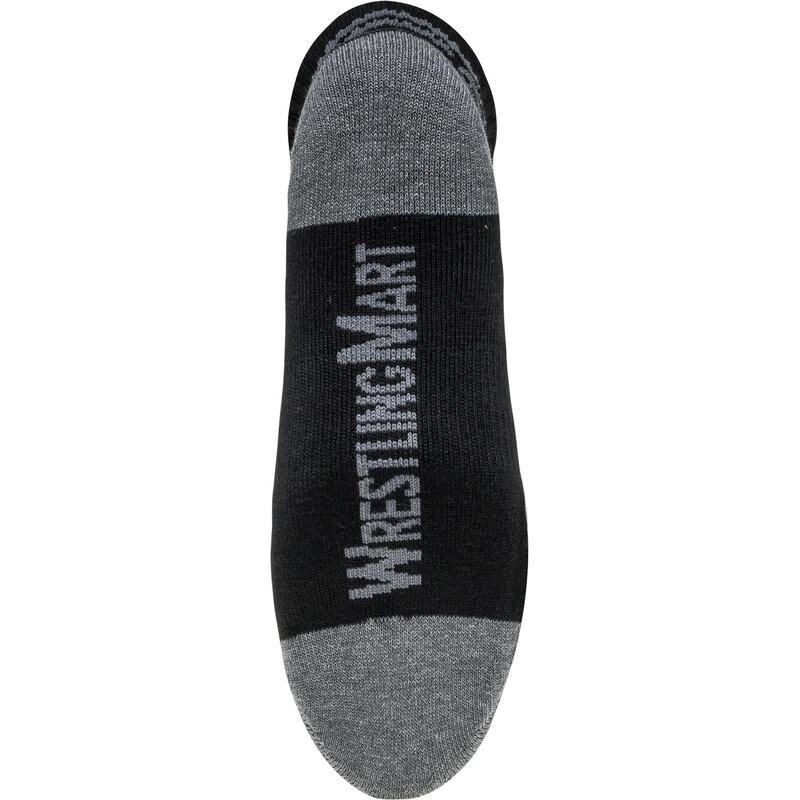 The guys at WrestlingMart were great recommending their socks. They feel great combined with my new Freeks. I will be buying more! The most comfortable socks ever! The best for practicing or for matches. I’ve even caught my brother wearing these because they are soooo soft, he’s not even a wrestler that’s the thing! These socks are comfy and awesome! I came all the way from Corona to buy these socks. Their the best sport socks out there. Last forever. Literally the most comfortable socks I've worn. Nice thickness. Great selections of colors and sizes! I really like the socks that I bought because of the quotes. I also like them because they are comfortable. Very comfortable and soft. I can rely on them because they won't rip. Super comfy! "Bring It Socks" are long lasting and they are still as comfortable as the first time wearing them. 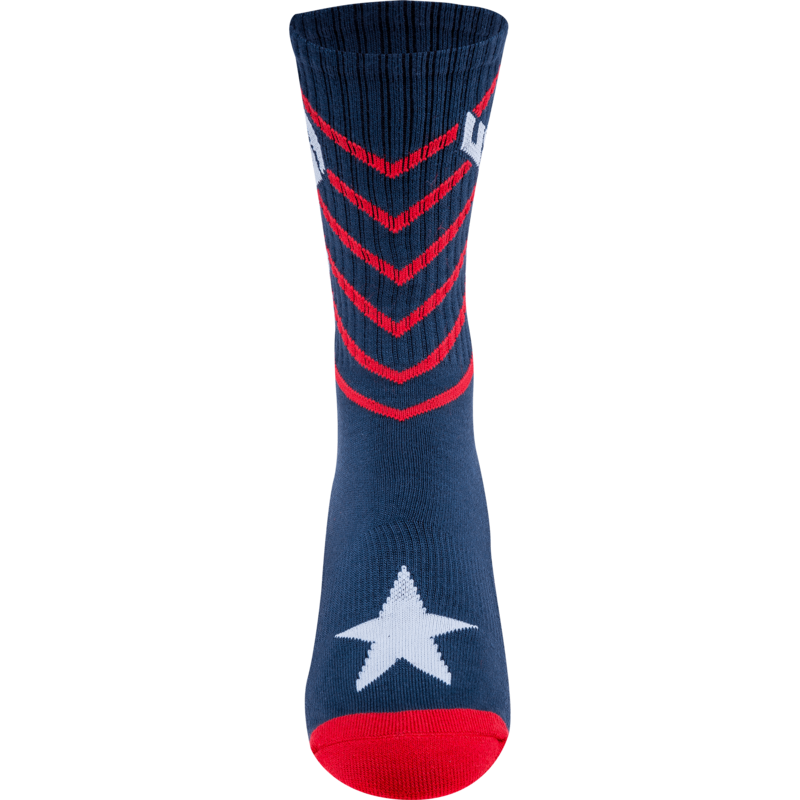 "USA" Socks. These socks are super comfy and have lasted through a bit. "Lets Roll" - My new favorite socks! The socks here are really comfy. The sock are pretty thick. They fill up the rest of my shoe when I need to take up more space. The socks are terrific. Great quality and seem to never get thin or shrink in size. Every wash and they get back to usual. 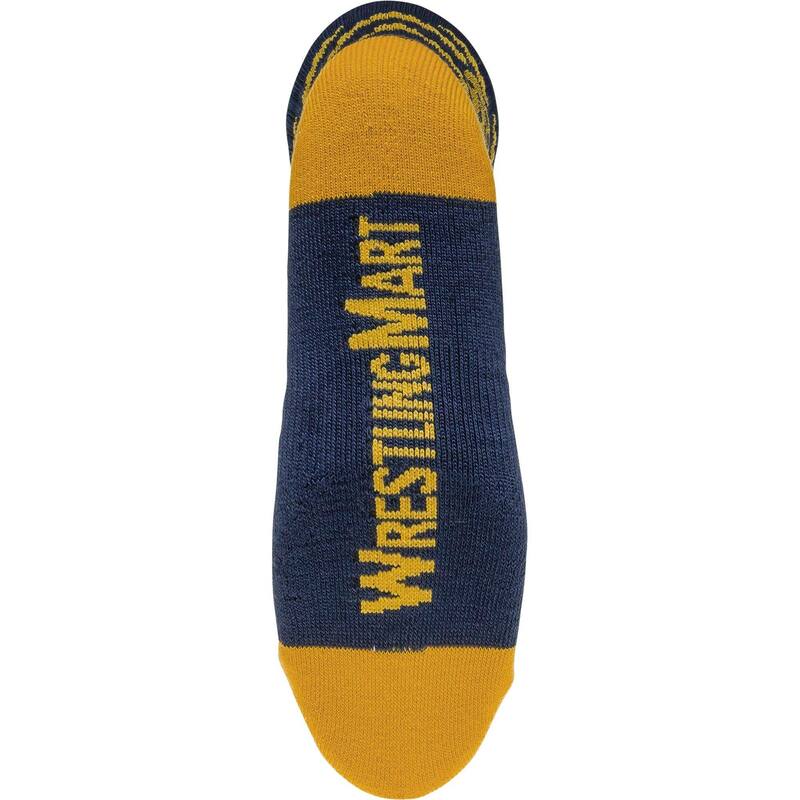 WrestlingMart Socks are really comfortable! They are very durable! Best part, love the colors! Pink and Blue are my favorite! The socks are really good. I had a pair before and they cushioned my feet while wrestling and they're nice to wear around after a match. 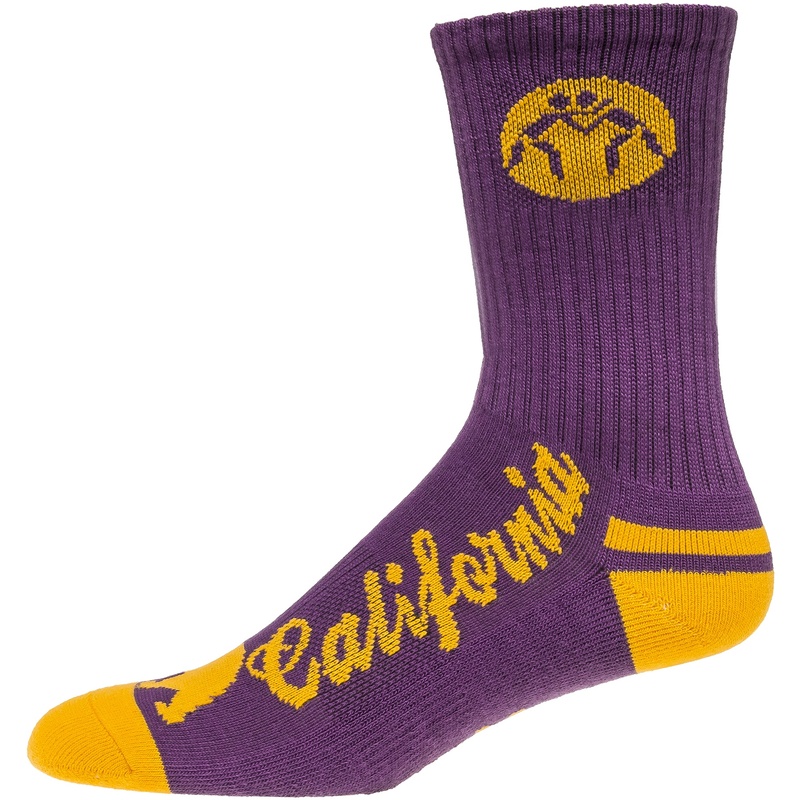 These socks are fashionable and always nice to wear when wrestling because they add a pop to your outfit. I enjoy long socks and I would say these are my favorite. My son has been wearing these socks since he was 4. Four years later he is still wearing them and loves how comfortable they are. 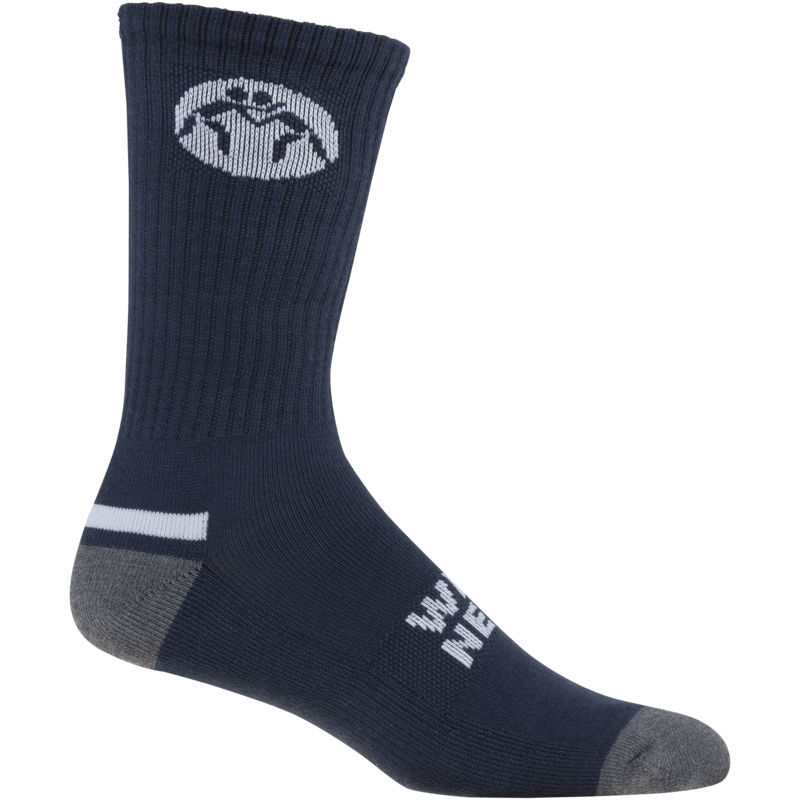 The wrestling socks last a long time and they are very durable during practice. They don't rip and I don't get any holes in them. 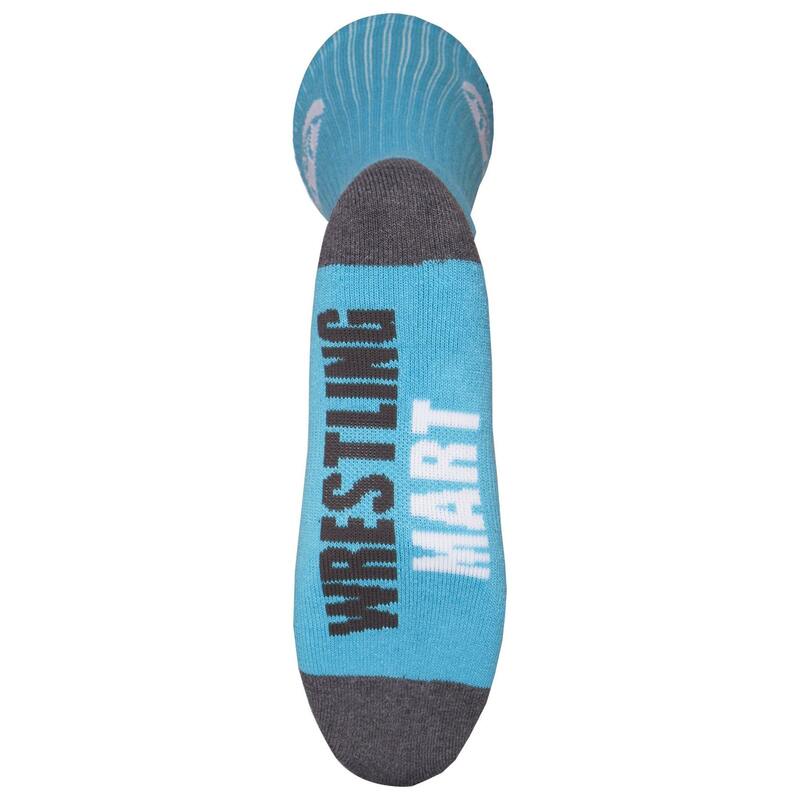 WrestlingMart socks are very comfortable and pretty thick, which makes it harder for them to rip and get holes in. These last a long time. They are thick and we have washed them several times and seem to be very durable. Very comfortable, awesome socks. 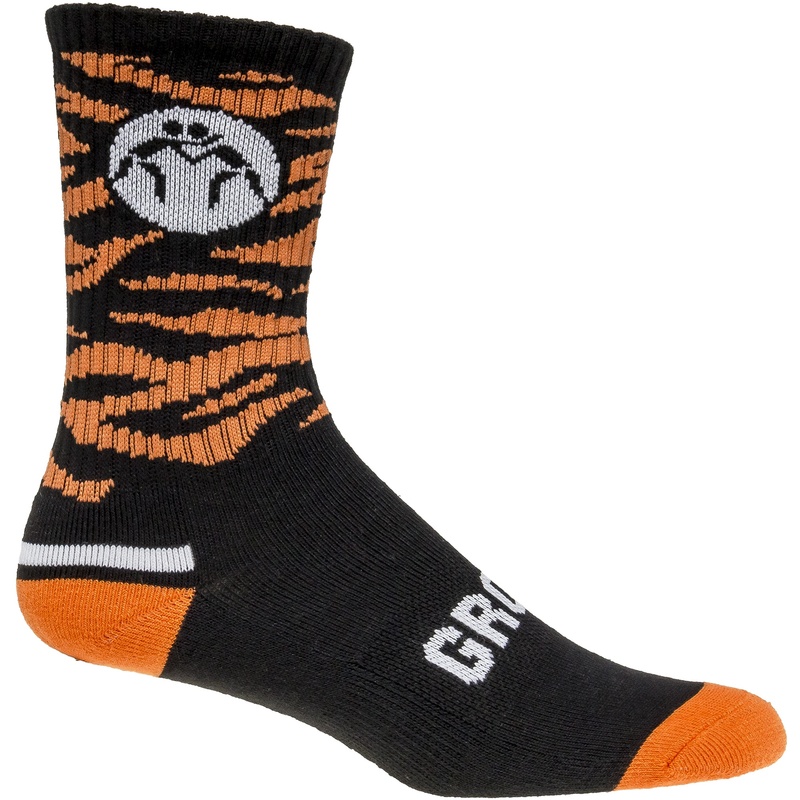 Keeps your feet very warm and great material. I enjoy these socks very much. I like the high cut design too. It shows over my shoes to show everyone where I got them, and where they can go to be as good and look as good as me. The socks feel comfortable and are soft. They feel nice on my feet! 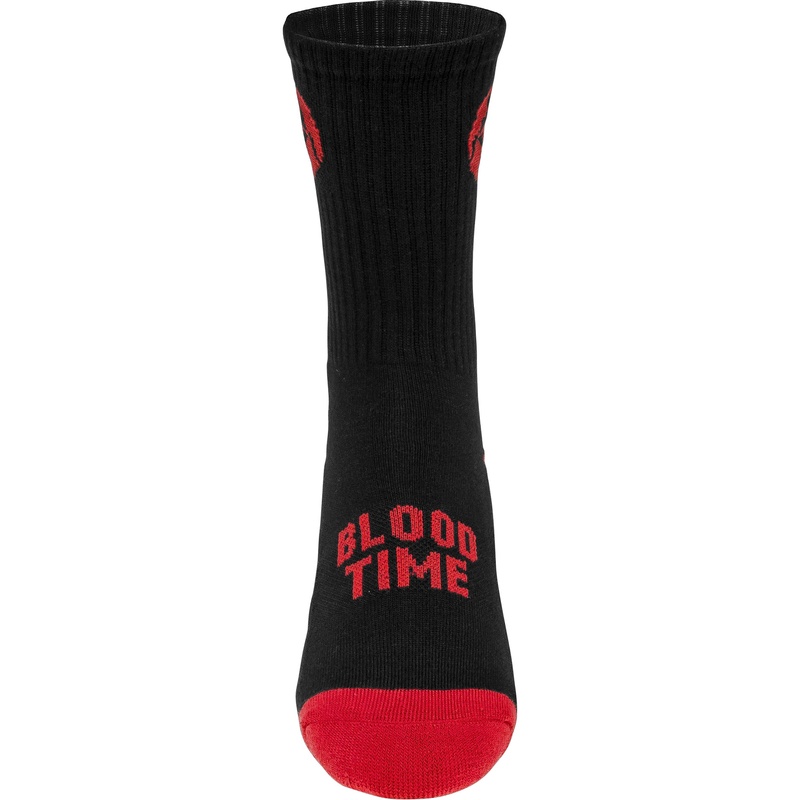 The socks are very cool and intimidating! 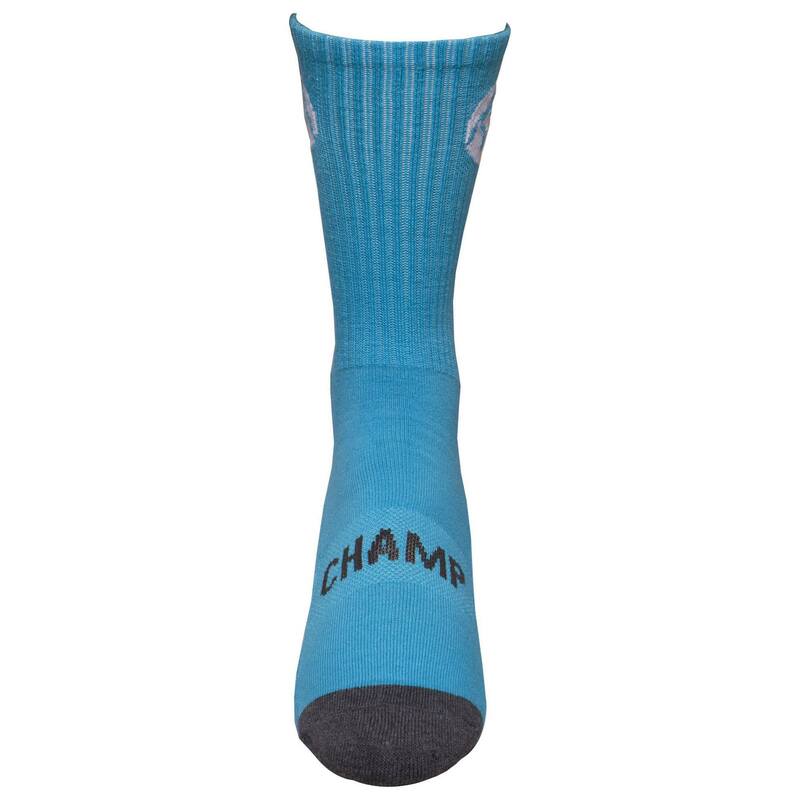 If you wear the socks your opponent knows they will have a tough time beating you. They are also very durable and long-lasting. I've had my own pair for years and they have not ripped. 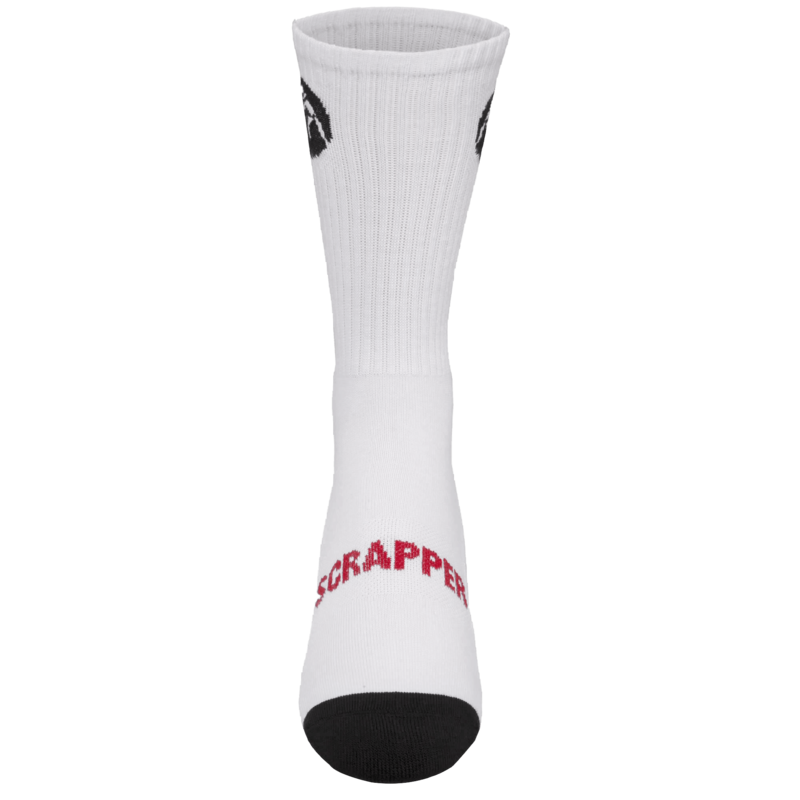 The Wrestlingmart "Scrapper" sock is way more comfortable than your average Nike sock. It's comfortable padding makes me want to wear them every day. I love these socks! They support my feet and don't slide down during matches. I feel that they improved my comfort on the mat, increasing my success. They are very comfortable and provide extra cushion inside my wrestling shoes. They are well worth the money spent. Felt great! Comfortable, nice fit and looks good. The color and texture was really nice. They have a better feel than Nike Elites, texture wise. Lots of variety in colors as well. Nothing to dislike except one pair didn't have my size. 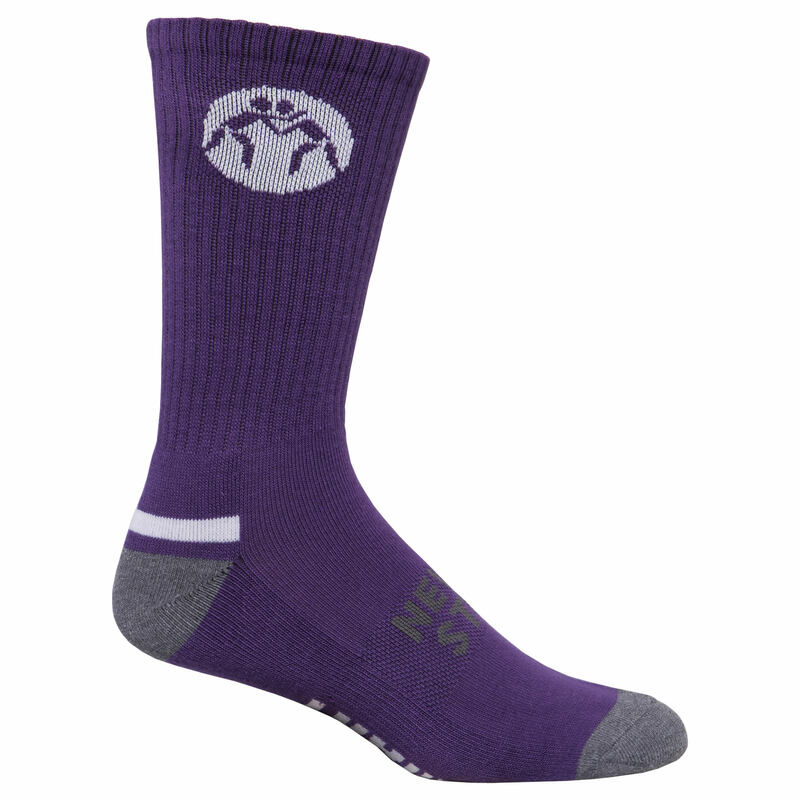 The socks are very comfortable and it feels very comfortable on the mat. 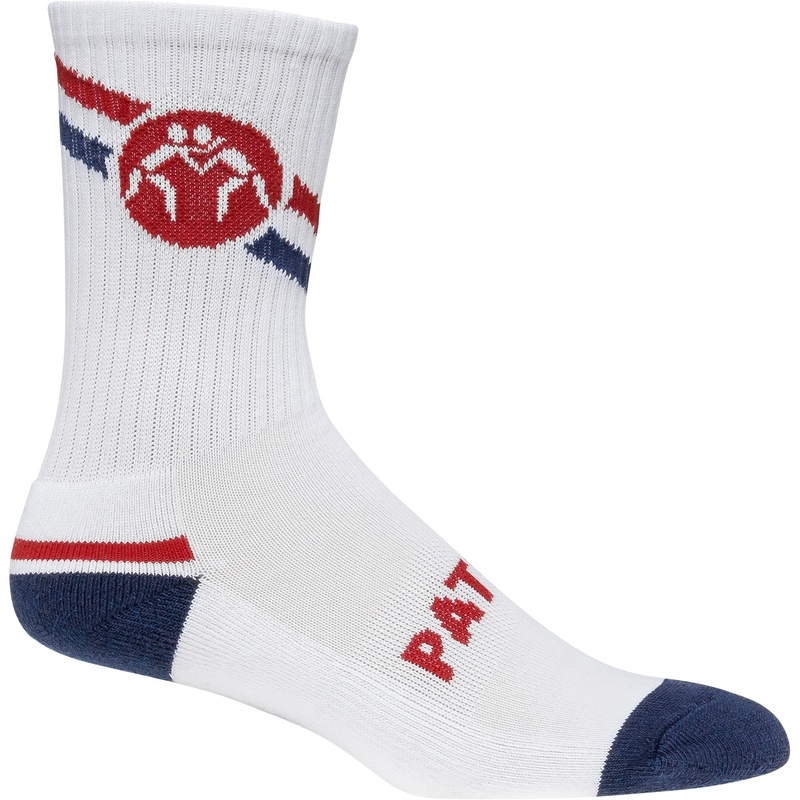 What I liked the most was that they are great quality socks for an affordable price. I like how comfortable these socks are. They performed excellent! I didn't like how small of a selection there was. Very comfortable! Feels really good, looks really good. I would really recommend them. I really like the color and how comfortable the socks are. great socks. fit well, and don't wear down through the years. Got them as a free bonus - and love them so much!!! Came back and bought 4 more :) Great quality and very comfortable! What sizes does this come in, Youth as well as adult? I will be ordering for our youth team and it ranges from 4-13 year olds. Approximately 42 pairs. Could you include shoe sizes for the sizes as well? 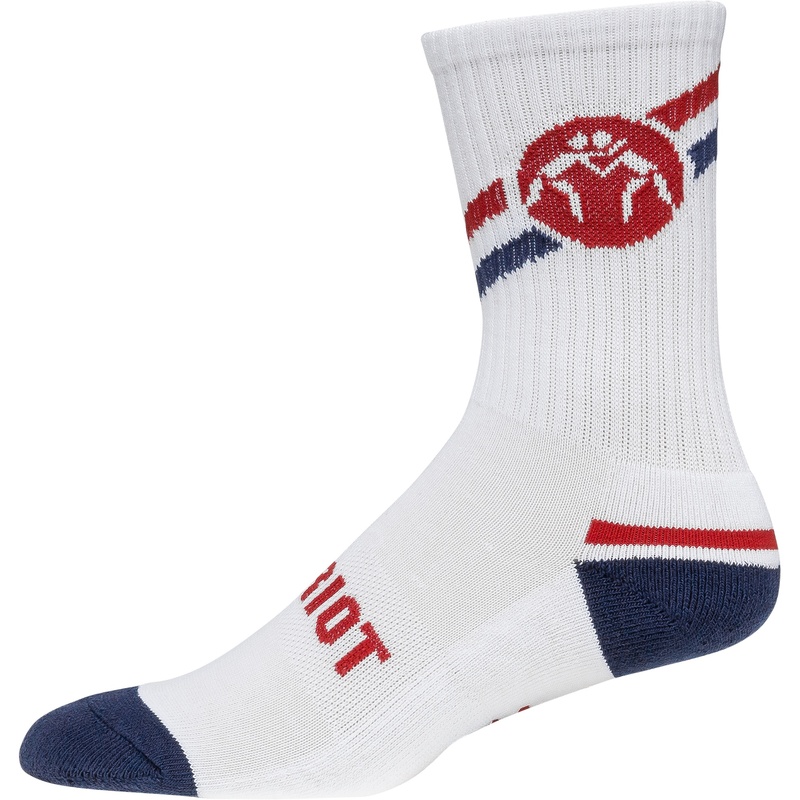 The socks are made for youth and adult. Socks are also based off of shoe sizes. If your wrestlers are in between shoe size K11-2 they would be the K11-2 size socks. 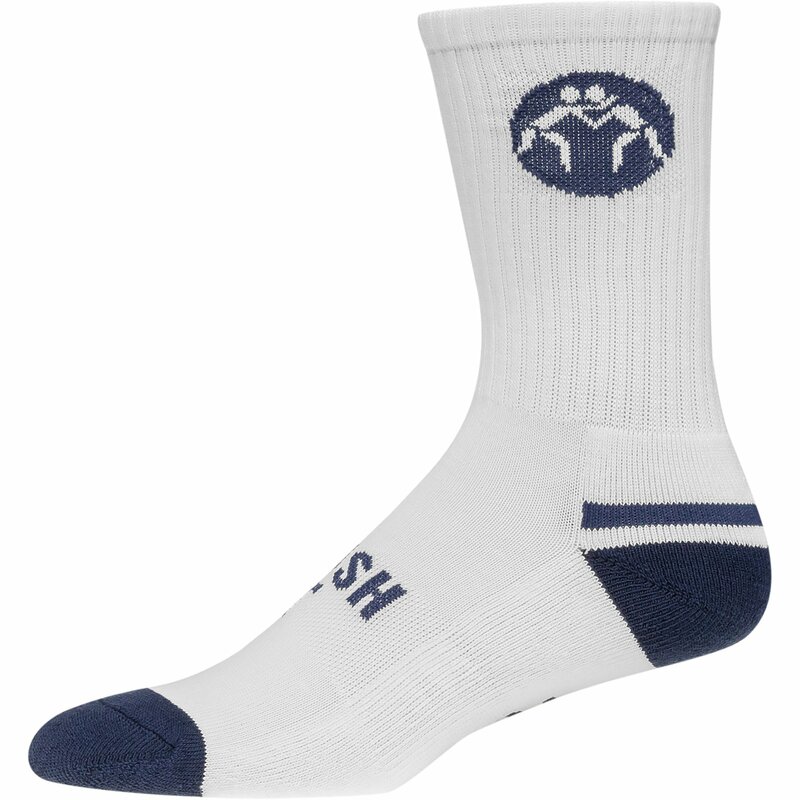 If your wrestlers are in between shoe sizes 3-6 you would be good with the 3-6 size socks. Same goes for the 7-9 and 10-14 size socks. If you have any questions, feel free to contact us regarding team pricing. 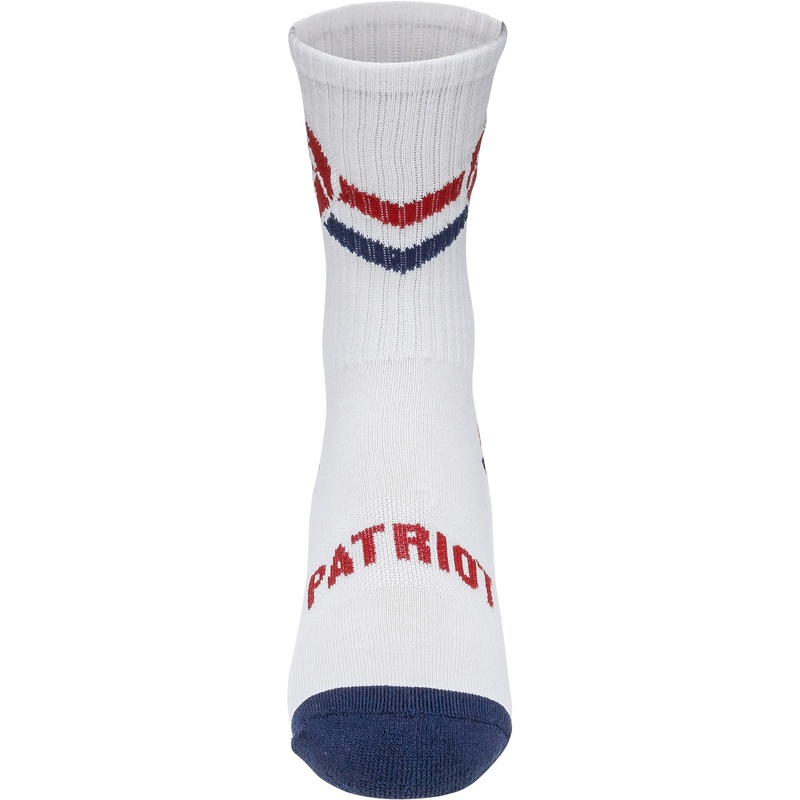 If I order today (Feb 9) is it possible to get 17 pairs of socks by Wednesday? Order's that are placed over the weekend are not processed until Monday morning. The shipping department is closed over the weekend. You may pay for the expedited shipping in order for the package to arrive on Wednesday. The smallest size that the pink socks go down to is 3-6. If you are looking for a team order, please call in to speak to a Team Sales Rep.
Socks are based off shoes sizes. 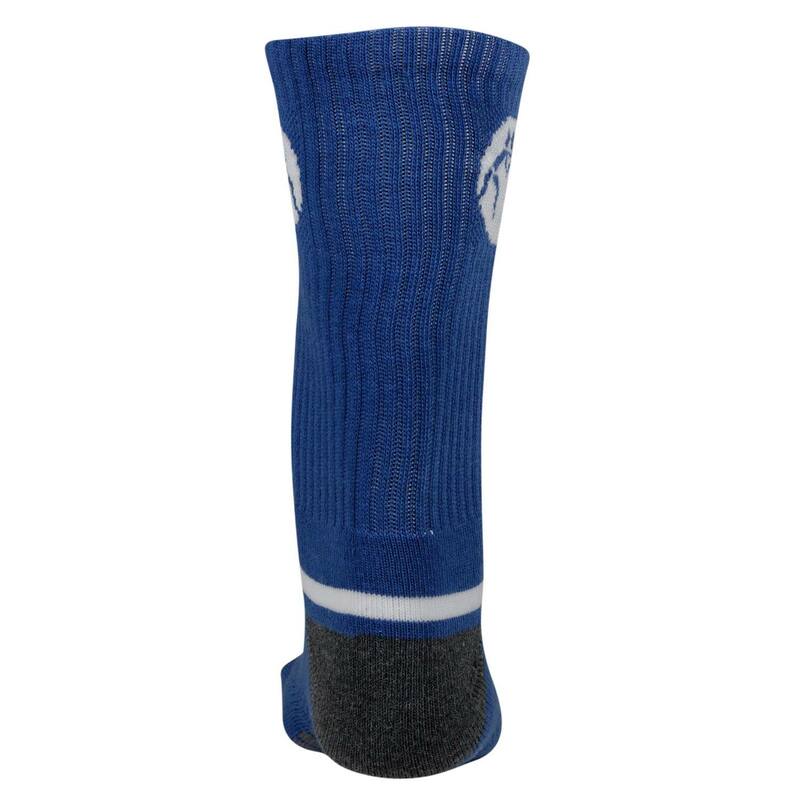 If they are youth size 11-2 in shoes they would be good with the K11-2 socks. Will this color come available in size 3-6? Which sock color were interested in? If I wear men’s size 11 shoe, what size sock would that be? We have free shipping with any purchase on our website. You may purchase only one sock if that is what you are interested in. Do you ship to South Africa? We currently do not ship internationally. Our team is currently working on providing international shipping for our customers. I do apologize for the inconvenience. My boys wear a size 6 mens shoes, what size of socks do you suggest? 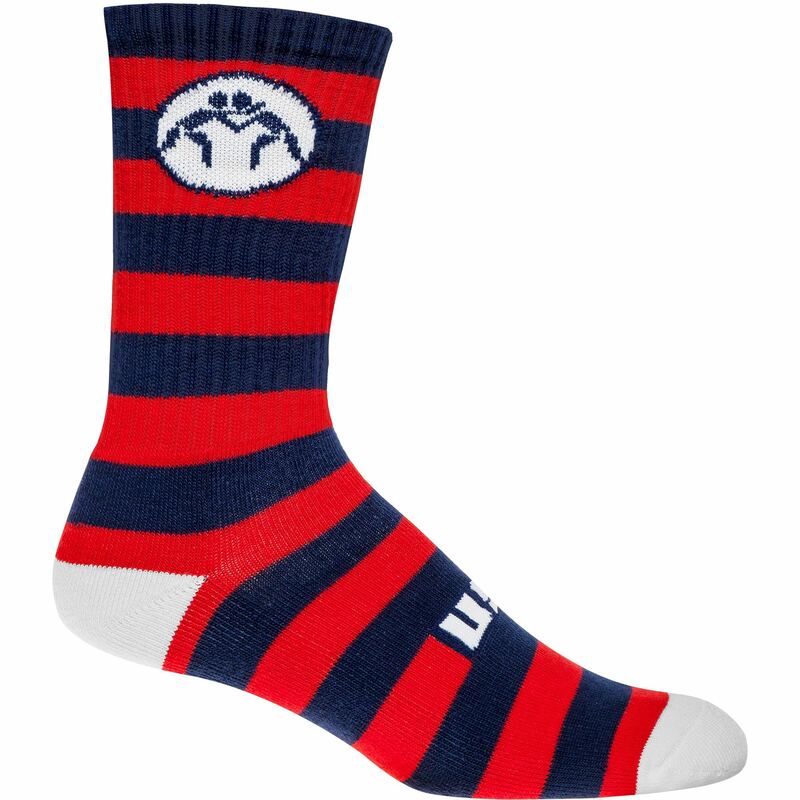 They should be able to fit in the 7-9 WrestlingMart Wrestling Socks. 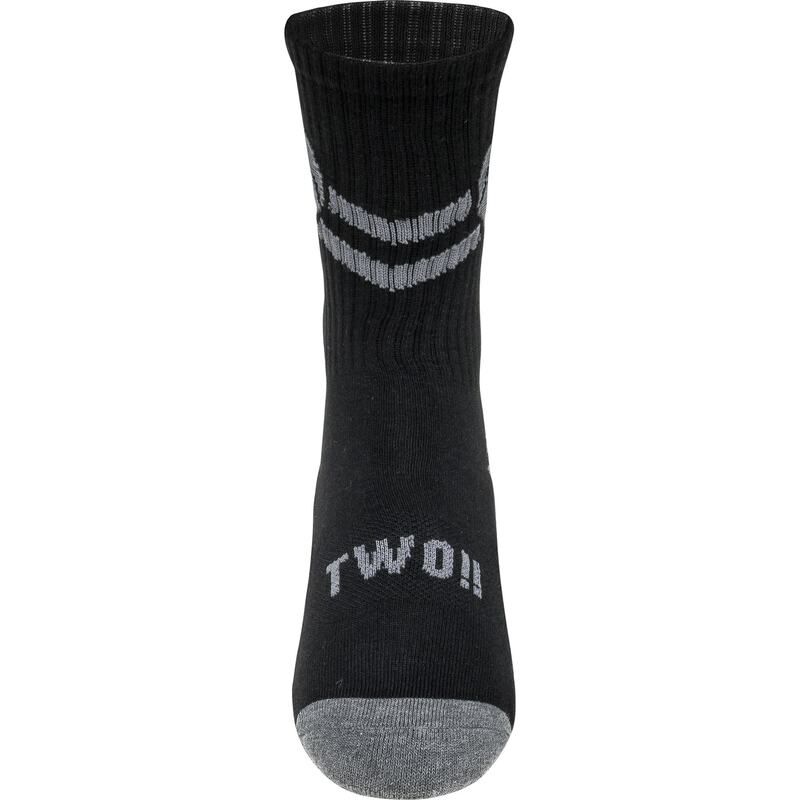 Hi I have a question of some pairs of socks not have a 3-6 size and I'm wondering how long would it take for that size to be put in stock again? 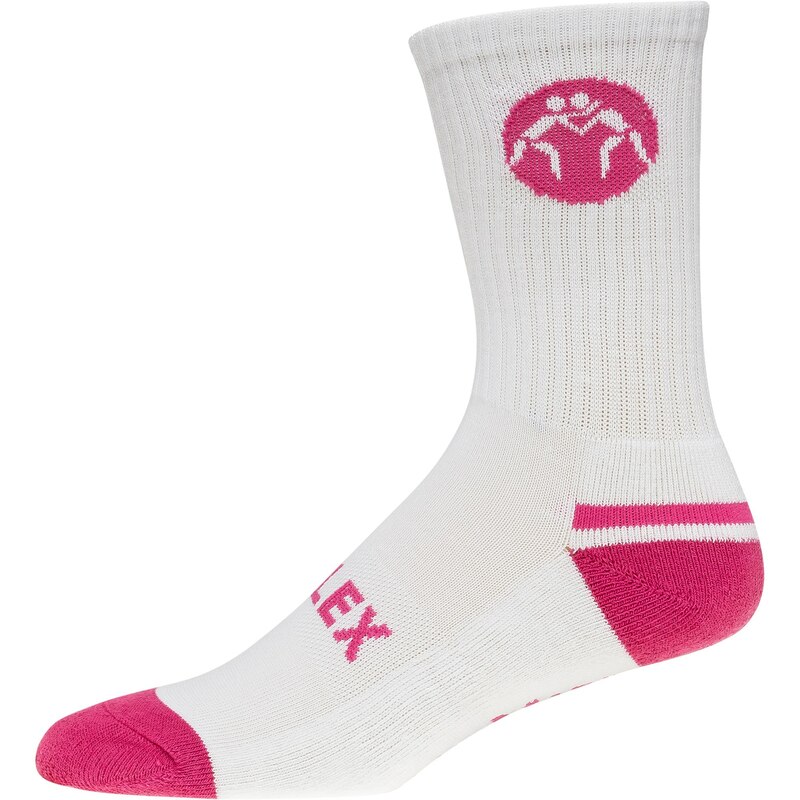 At the moment we only have 3-6 socks in 4 colors, Pink, USA, White/Black and Black/White. 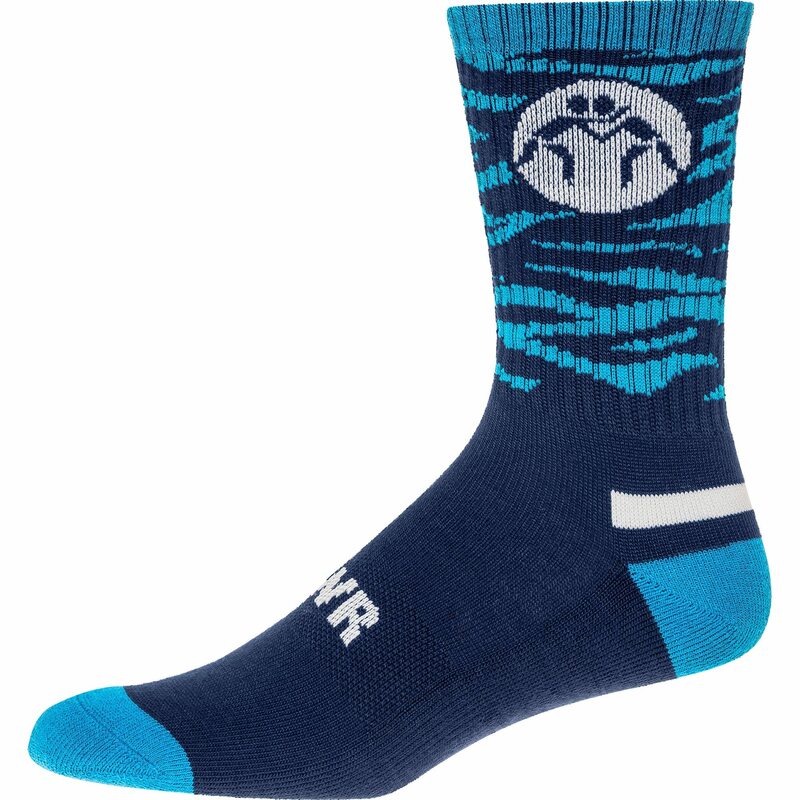 We are currently working on new designs for socks and deciding what colors we are going to be bringing in for the 3-6. I do apologize for the inconvenience. 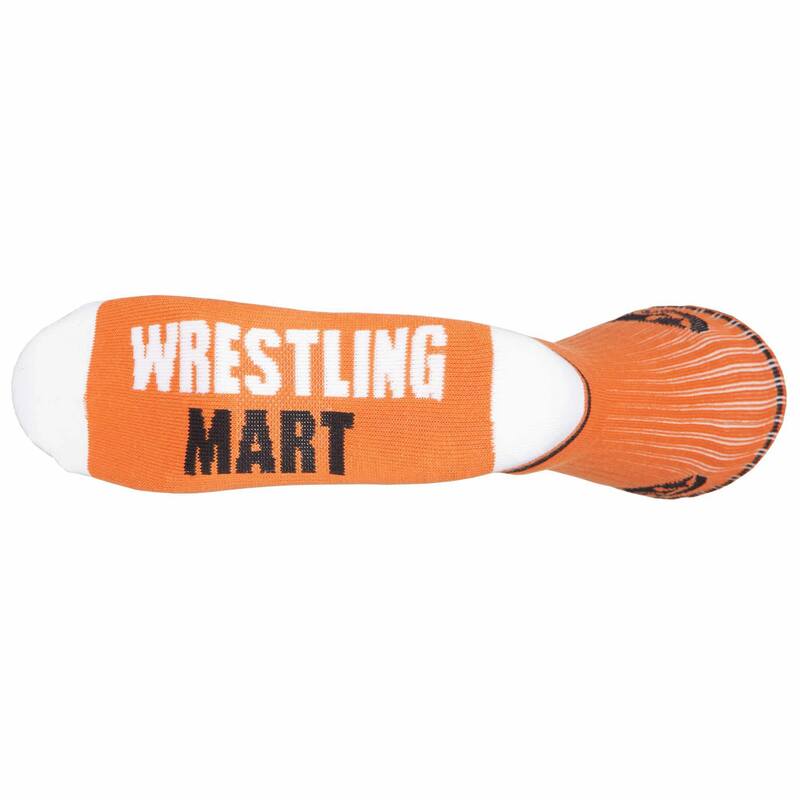 WrestlingMart has been supppoting the Wrestling Community since 2002. 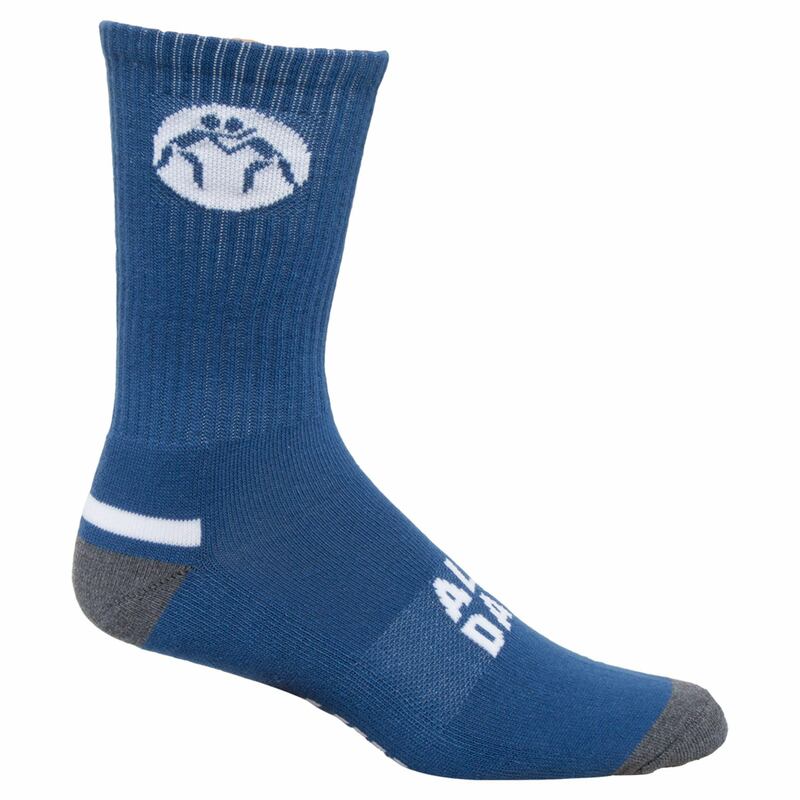 The youth sized socks are K11-2 and 3-6. I am interested in the WrestlingMart Wrestling Socks Dark Green/Gray / White. Can I get special pricing for 30 pairs? 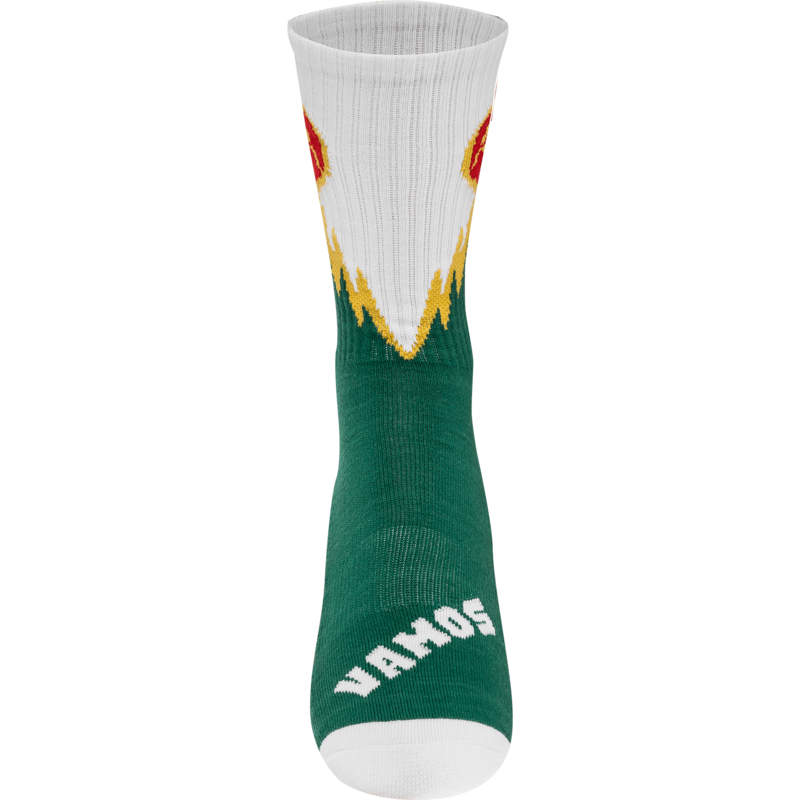 Also, do you do any customizing on socks that I can offer as a fund raiser for my HS team? 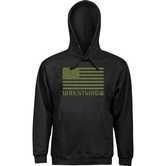 I am the Mat Club president and we are looking to raise money for the team with apparel sales. Let me know please. 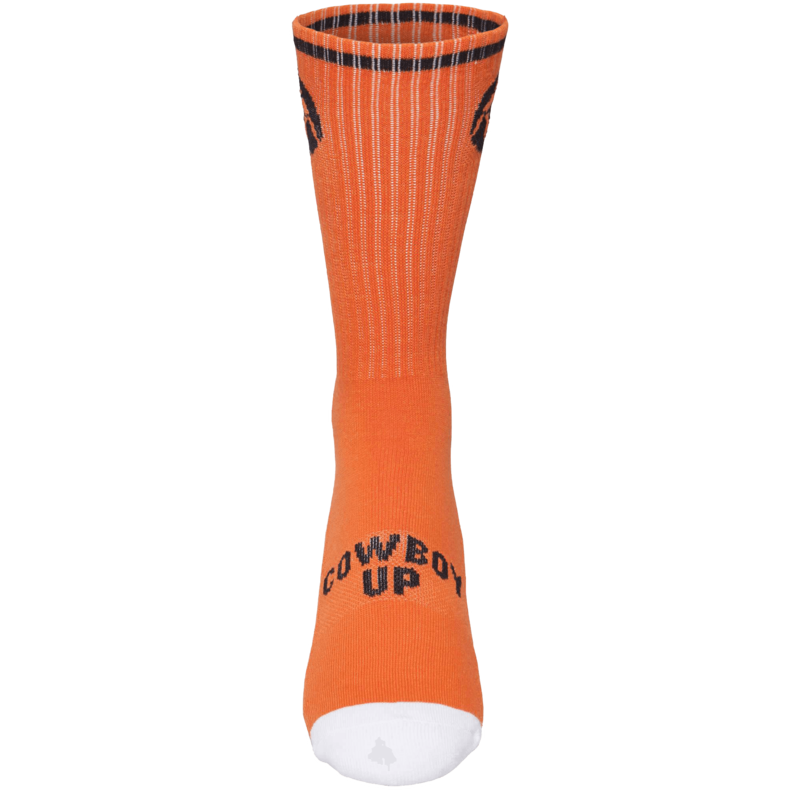 If you have questions about special pricing along with customization of the socks feel free to call our team sales reps 888-887-8893 that are here in the morning. They can go more into detail. What does this socks say? The pink sock says "Bring It"
What sock sizes are for men? Everything I click on says women sizing down below in the description. If your wrestler is between the size range of 7-9 or 9.5, I would say to go with the 7-9 socks. If your wrestler is a size 10 and up, I would recommend going with the 10-14 size socks. My 9 year old son is a shoe size 3. Trying to decide if I should get him the 11-2, or the 3-6, with him being on the smaller end. Wasn't sure how big the 3-6 really are. Can you please help me decide? Thx so much!! 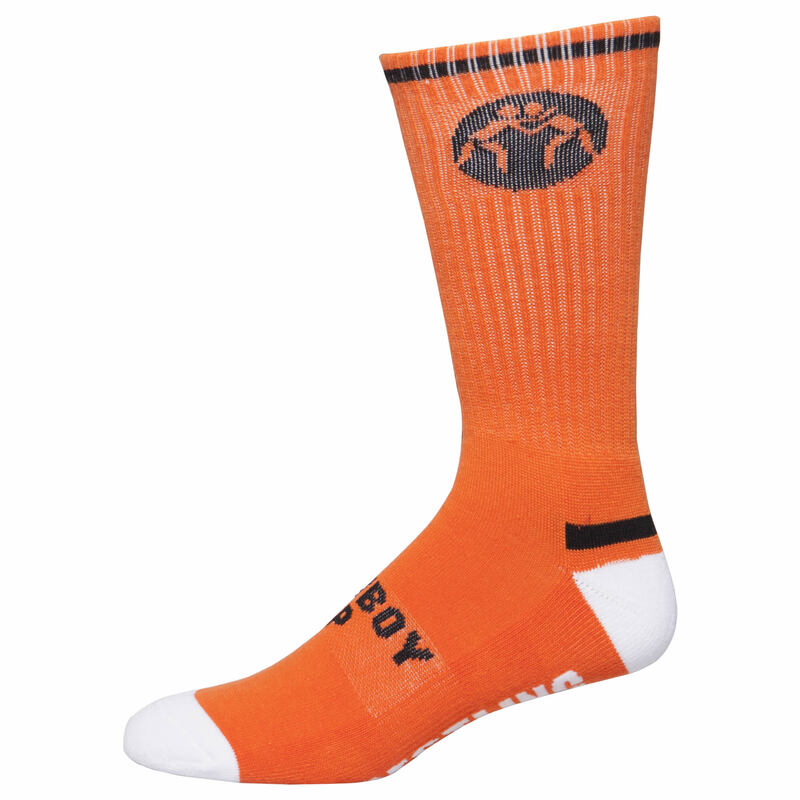 Looking to order socks for my adult son shoe size 13 the 10-14 is for adult men correct? Yes that is correct. Size 10-14 would be the right size for him. My son is 8 yrs old and wears a size 2 shoe. What size sock? He would be the K11-2 size socks. my son shoe size is 91/2... what size should he get? Thanks Dave!! So your blue USA socks you guys only sale them in the size K11-2? Or are the other sizes just out of stock? How big is the size k11-2? Is it really big or really small? Thank you so much! I love the name! 4xst8champ is very creative : ) Our K11-2 socks are designed for youth wrestlers and will fit the K11 through youth size 2 feet. If you're looking for bigger socks, our 10-14 adult wrestling socks are the largest we sell. My son wears an 8.5 in a wrestling shoe. What size sock should I buy for him? Thank you! I would get the size 7-9 socks. All sock sizes should coordinate with shoe sizes. I'm a size 6.5. What sock size do you suggest I get?